Park Jee-yung dropped out of college, and went to work on a Korean domestic ferry, when her father passed on, two years ago. It’s what Korean children do for their families, in the Confucian tradition of filial piety. 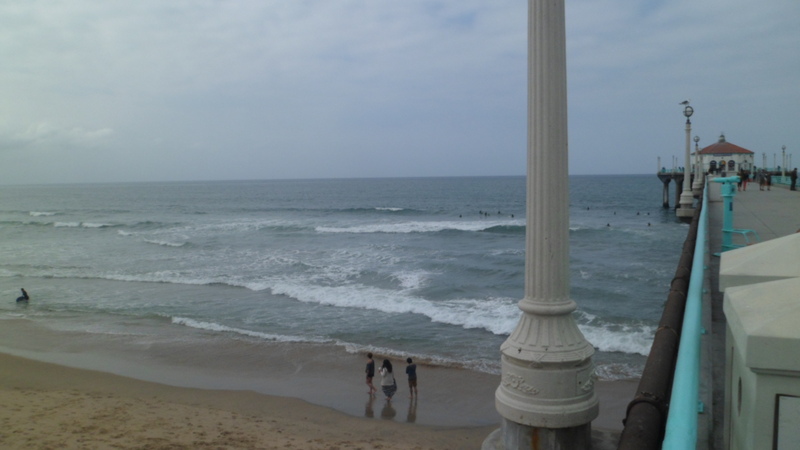 Two weeks ago, Miss Park found herself, along with nearly 400 other young people and 75 elders, on an ill-fated journey to Jeju, Korea’s holiday mecca, some 60 miles off the southwest tip of the Korean Peninsula. 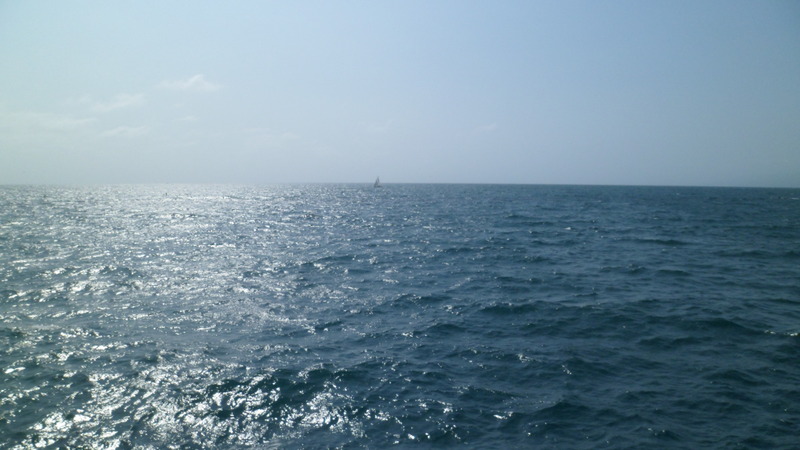 This journey entailed sailing from a port in the Seoul area, and thus a potentially treacherous voyage through countless areas of rock and reef. The story of how the journey ended is gradually unfolding: Essentially, an inexperienced and unconfident helmsman, scarcely more than a child herself, lost her way and the ship foundered into a mess of rocks. It’s not certain where the ship’s captain was during this time, but it is notable that he left the ship while most of his passengers remained aboard, and the ship was going inexorably down. Park Jee-yung stayed with the teenagers, going as many places on board as time allowed, finding life vests for her younger charges and trying to get as many on board life rafts as she could. 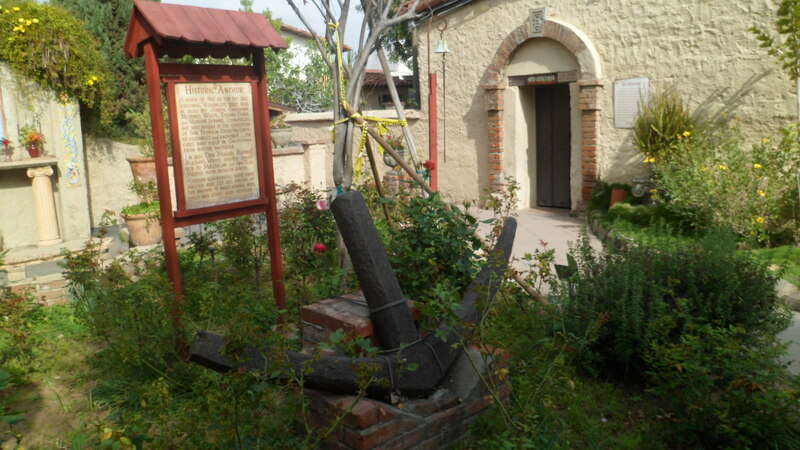 Survivors reported that Miss Park repeatedly refused to leave the ship, saying it was the crew’s duty, and thus hers, to be the last to leave. So it went- for her, and possibly other crewmates, though not for the senior ship officials. This has become de rigeur, in recent years, for the crews of troubled vessels, but I digress. I lived in Korea, on Jeju, for 5 1/2 years. The vast majority of the people I met were like Park Jee-yung- bright, organized, and self-effacing. I can only imagine the horror that has engulfed this blessed nation, whose traditions dictate that a people move forward together, that the needs of the whole trump the whims of the parts, that children mind their elders, without question. So it went, that horrific day. The aging ship’s captain issued an order to the students on board to stay in their cabins. A few rowdy boys chose to challenge that order and went on deck, saw what was happening and, rallying some of their schoolmates, managed to get on board the life vessels and to safety. One of them was the first to issue a distress call to the mainland. These were among the people helped by Park Jee-yun. There is much to admire about Korean society. Few nations could have risen out of the ashes of war, largely on their own, as South Korea has. Shoulder to shoulder, Koreans have seen what was needed, and brought it about. Now it is time to take stock of the price of fragmentation- nearly 160 dead, as I write this, and hundreds more still missing. I sit here, in the comfort of an American home, and feel only grief and sorrow. So many beautiful souls, who could have only elevated life in their city of Ansan, and beyond, now sit at the Throne of the God of us all, and wait to see just how they might comfort those who miss them so grievously. Let Korea continue to move forward as an entity, with the caveat that sometimes, many times, the voices of the rambunctious need to be heard. The gadflies among us frequently see things the masses overlook, and their warnings, however irritating at the get-go, turn out to be what save the day. Cassandra was not altogether insane. Rest in peace, beautiful friends, and may the nation you left too soon regroup, restore its sense of balance and move forward, in unison. Redlands, CA is one of those towns one could zip past, on the freeway, and totally miss out on one of life’s grander moments. 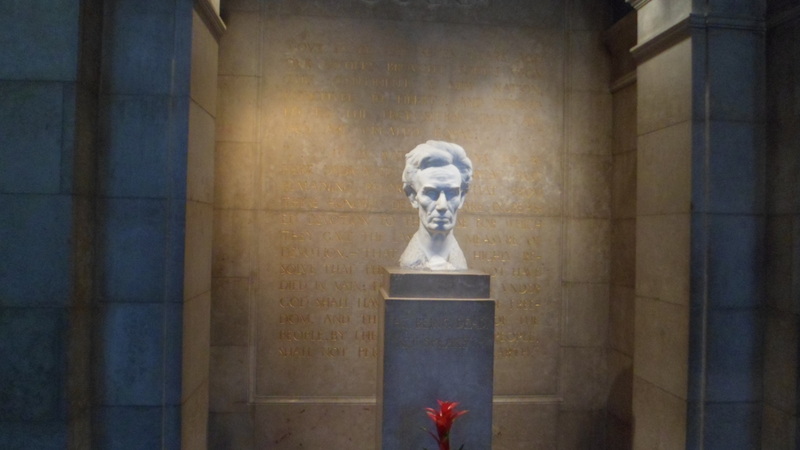 The town’s whole raison d’etre is the advancement of learning- from its university, established by the Seventh Day Adventists, who were the community’s prime movers, to the Lincoln Shrine, which honours our 16th President, while promoting the study of civics and, of course, A.K. 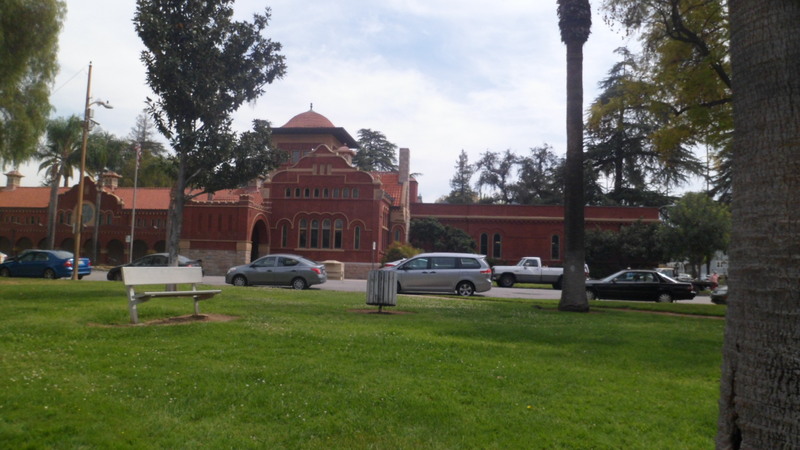 Smiley Public Library, established for the people of Redlands in 1894. 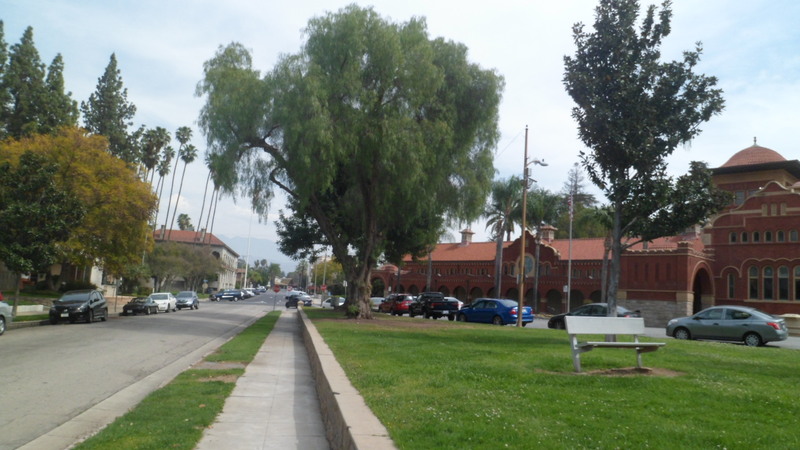 I first became familiar with Redlands, and nearby Loma Linda, when I first dated Penny, in 1981. 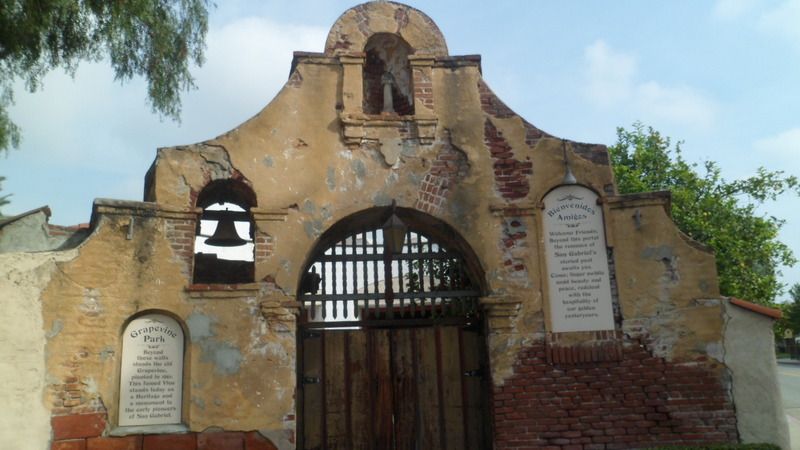 We visited her Seventh Day Adventist relatives here a few times, but I never really took photographs of the area, until Sunday, March 23, as the last leg of my most recent SoCal adventure. 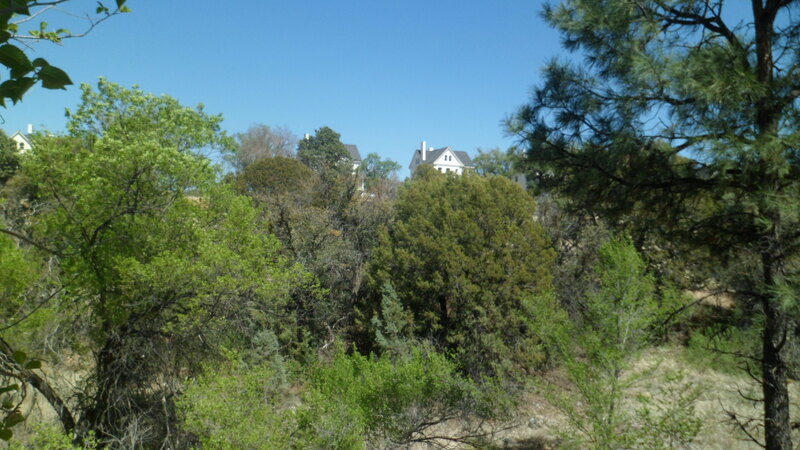 Here are some views of the mountainside, and of downtown Redlands. 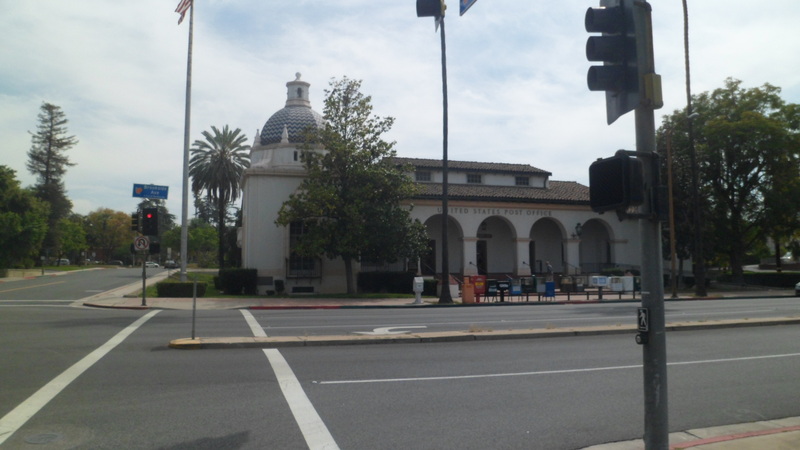 The Post Office set the tone for my expectations of Redlands architecture. The movie theater, just north of Redlands Mall, didn’t disappoint, either. 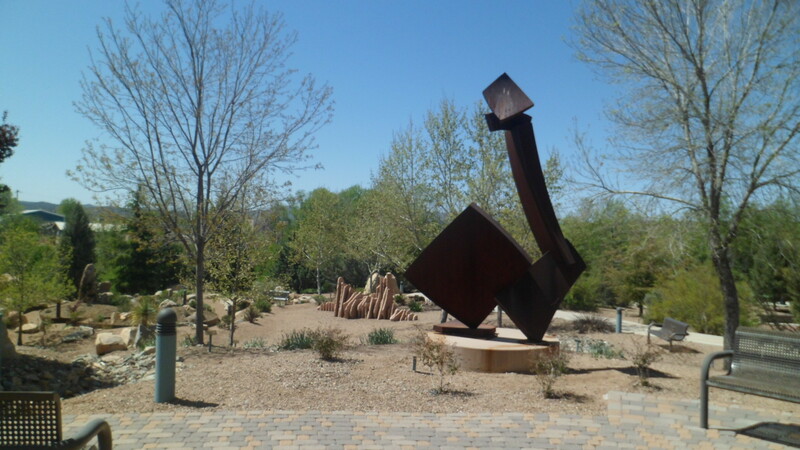 It was the Smiley, however, which really stood out and dominates the scene, from its place on the mountainside. Two of Redlands more prominent early citizens greet the visitor. They are, of course, Albert K. Smiley, and his brother, Alfred. Each year, green hats are placed on the two, in honour of their March birthdays. The next two shots give an idea as to the size of this edifice. 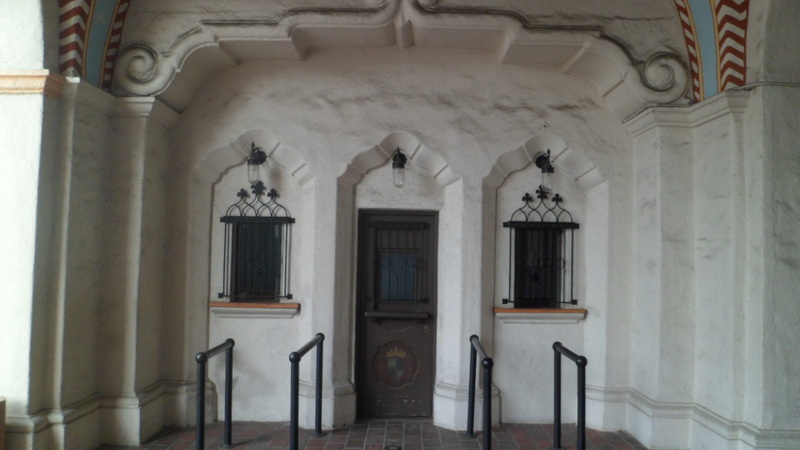 Below, the main entrance is given some justice. 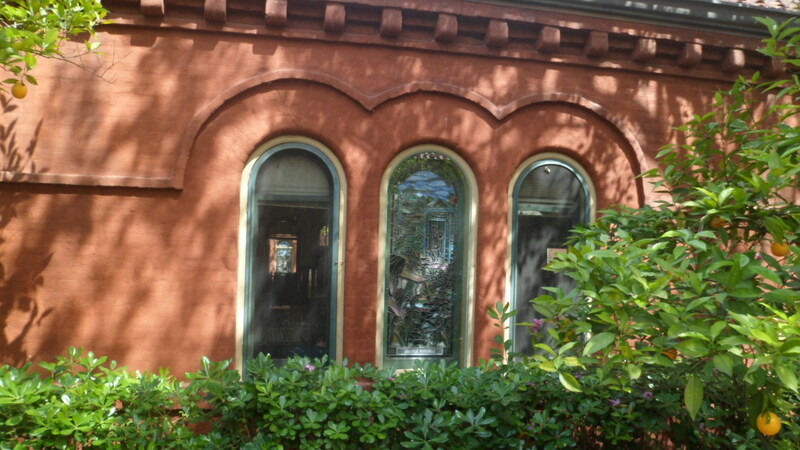 Stained glass adorns most of the windows. 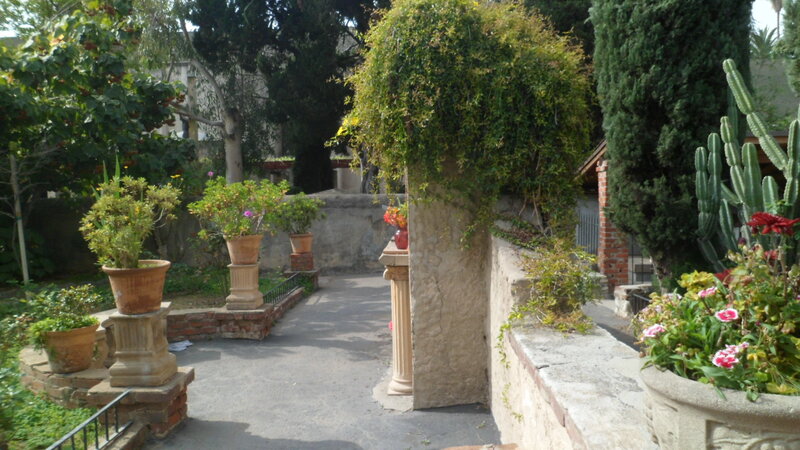 As is the case in most buildings of the time, garden courtyards may be found on either side of the main corridor. 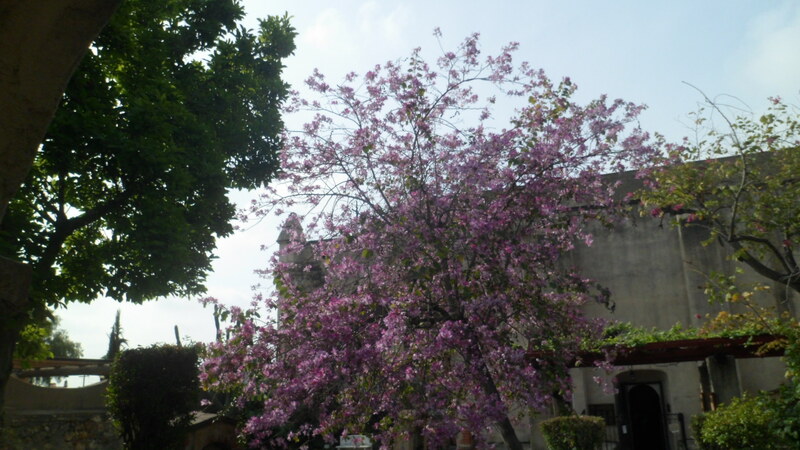 Cherry blossoms are as prolific here, as anywhere in southern California. 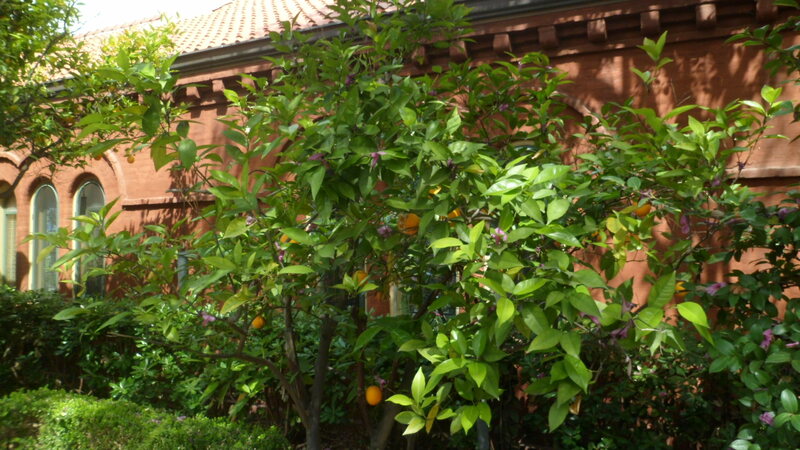 Orange trees symbolize what brought material prosperity to San Bernardino County, as well as nearby areas of the Los Angeles Basin, pre-suburbia. As devout as SDA people are, they also have a playful side. 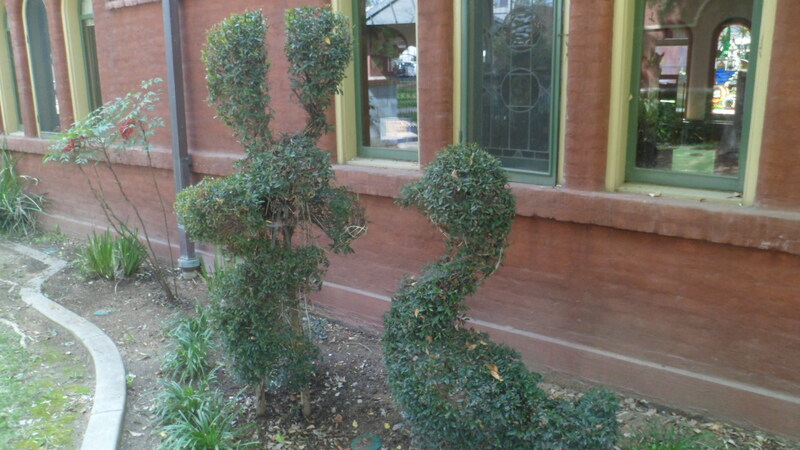 Here are a couple of signs of Spring, topiary-style. 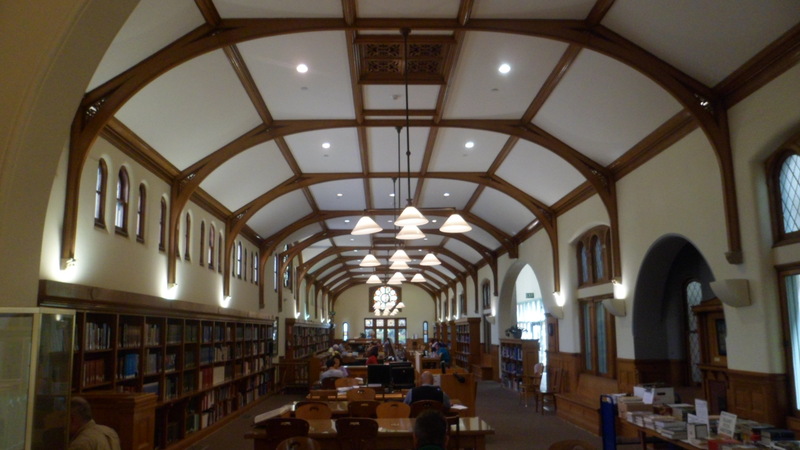 The cavernous Main Reading Room lends gravitas to the Smiley, as well. 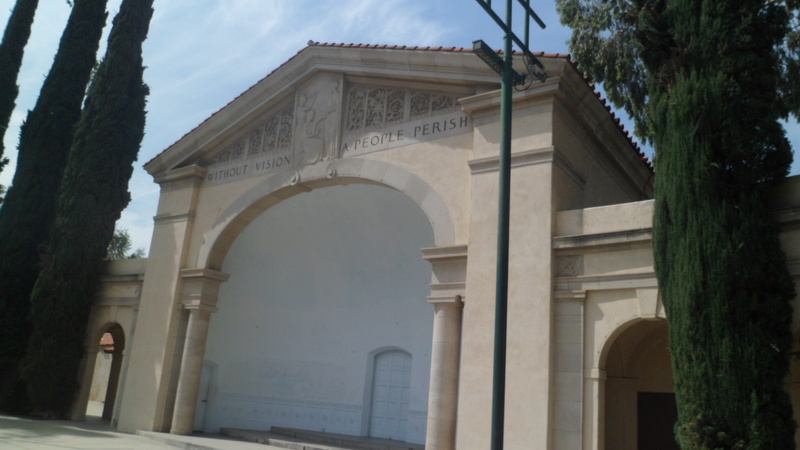 Immediately to the south of the Library is the Lincoln Pavilion. Honest Abe, and an impressive collection of Lincoln memorabilia, are on display within. 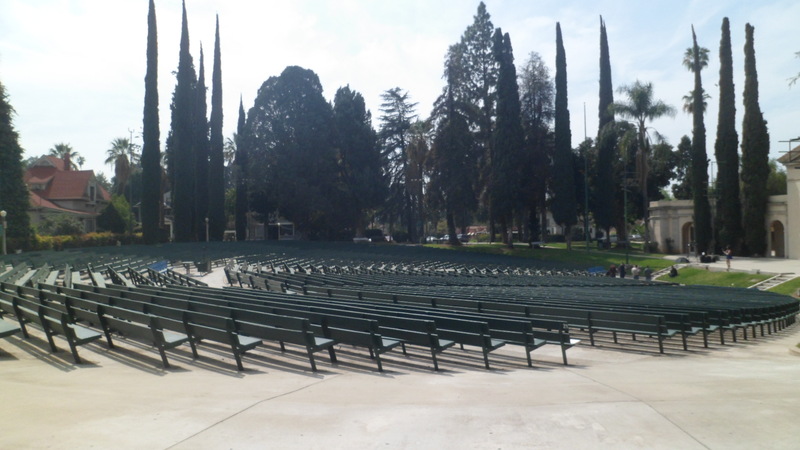 I spent about 30 minutes inside, then went across the street, for a look at Redlands Bowl, the municipal amphitheater. A photo shoot, featuring a fashion model, was in progress when I made my visit. 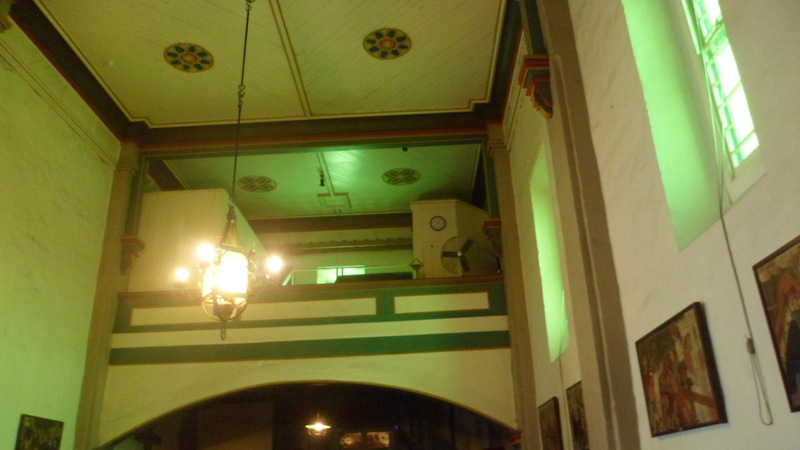 Without disturbing the young lady in her work, I got a few shots of the venue. Note the many Italian Cypress planted here. After this, it was time for a stroll downtown. I was delighted to find an ice-cream shop, which features made-to-order, nitrogen-infused delicacies. After enjoying some salted caramel ice cream, I noticed that Mom and Pop are working hard for local children. 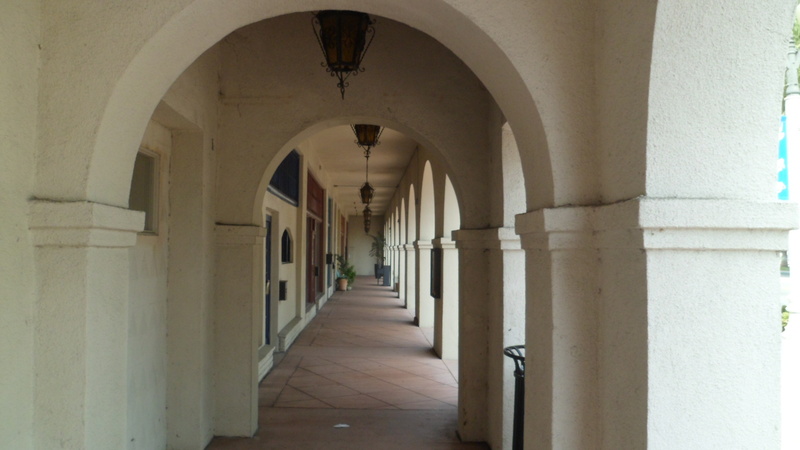 Downtown Redlands, on a Sunday afternoon, was serene, even with a modest crowd meandering the streets, including some local teens, who were shadowing me from a safe distance, while giggling and goofing around. 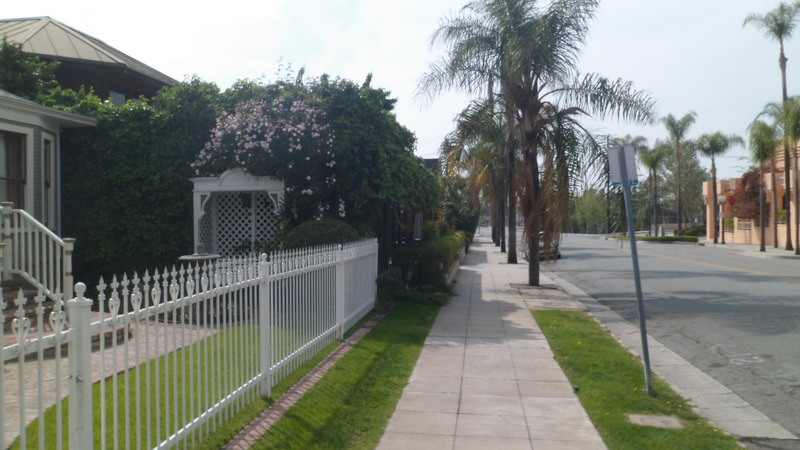 Redlands homes are mostly well-kept, and surrounded by greenery. So, another lovely trip to the Golden State came to a sweet end, courtesy of yet another fine locale, in the underrated Inland Empire. 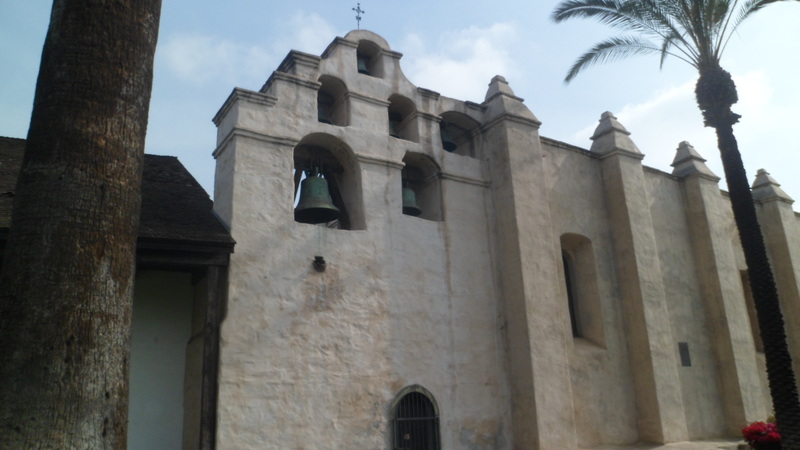 On this Easter, 2014, let me share the final segment of my March 23, 2014 visit to San Gabriel, CA: The church itself. Here, en route to Mission Church, is the Mission Elementary School. 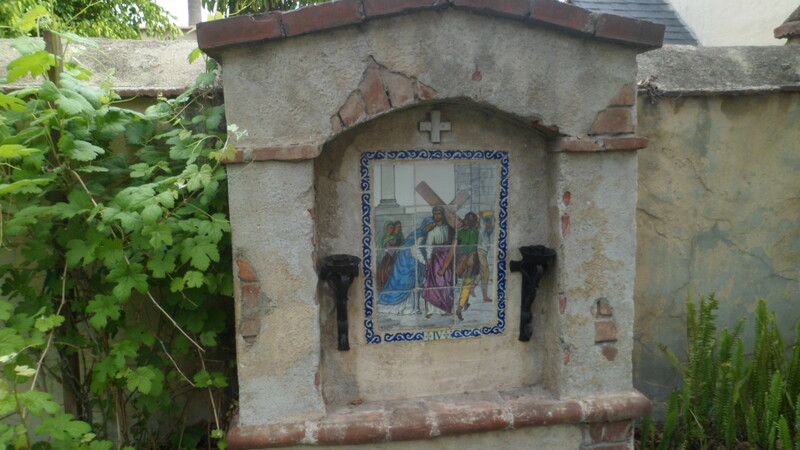 Here is the Campanario, or Bell Assembly, on a wall separate from the Mission Church itself. 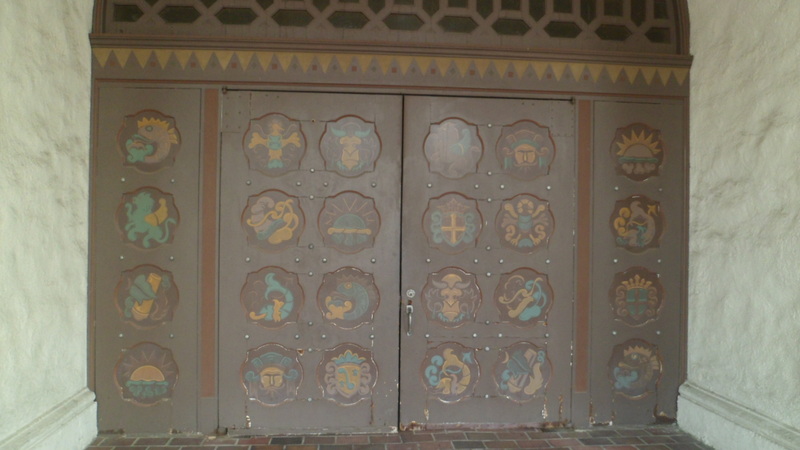 The Mission Church’s main entrance features this decorative door. Inside, it is the Holy Spirit Who hosts one and all. 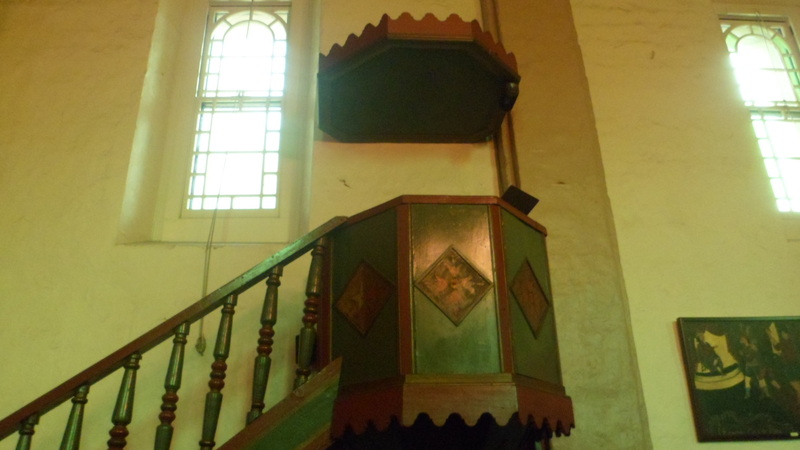 The deacon has his own loft. So, too, does the choir. 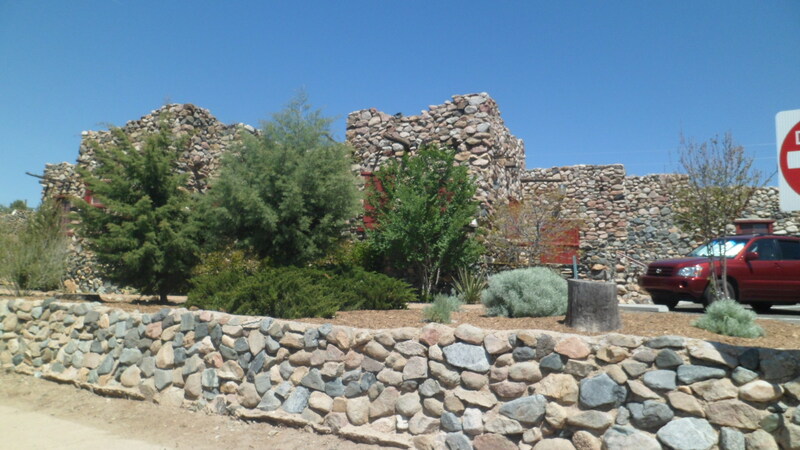 The adjacent museum features one of the original decorative columns on the outside. 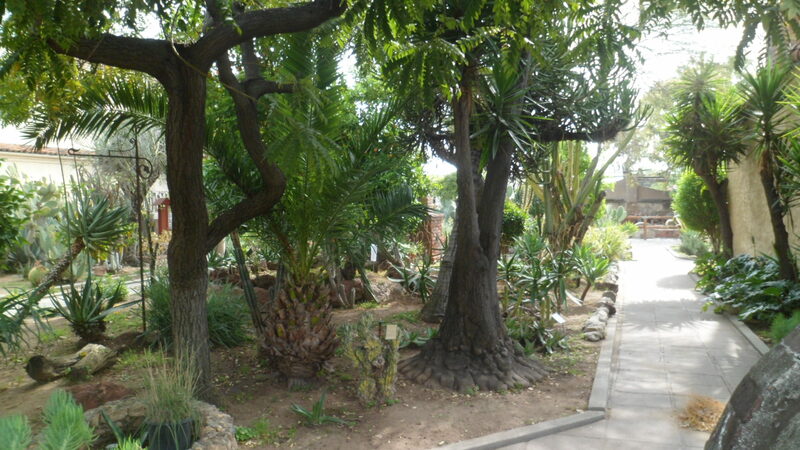 Glimpses into the lives of the monks also continue here, as they did in the Garden. 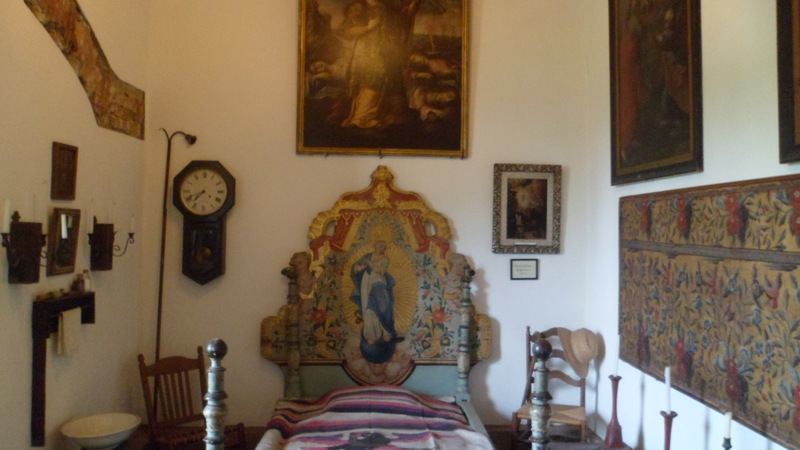 The Abbot’s bedroom was small, yet looked comfortable enough. 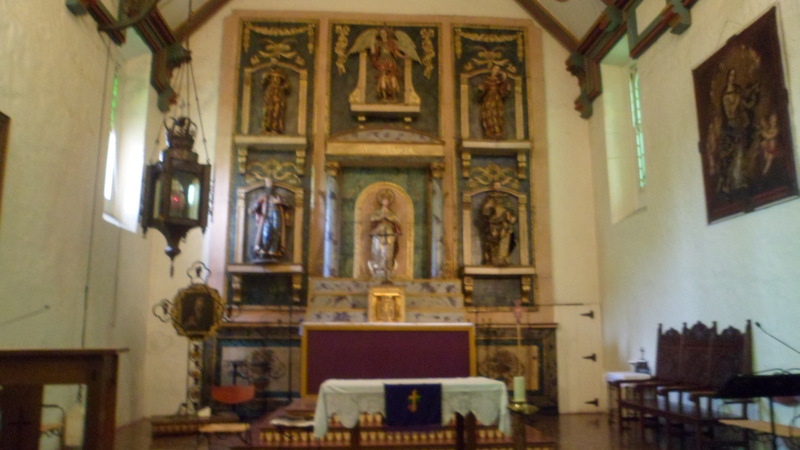 Here is one more look at the Mission Church, as the congregants prepared for a mid-Lenten after-Mass gathering. The Pride of the Missions certainly lived up to its sobriquet on that sunny and happy day. 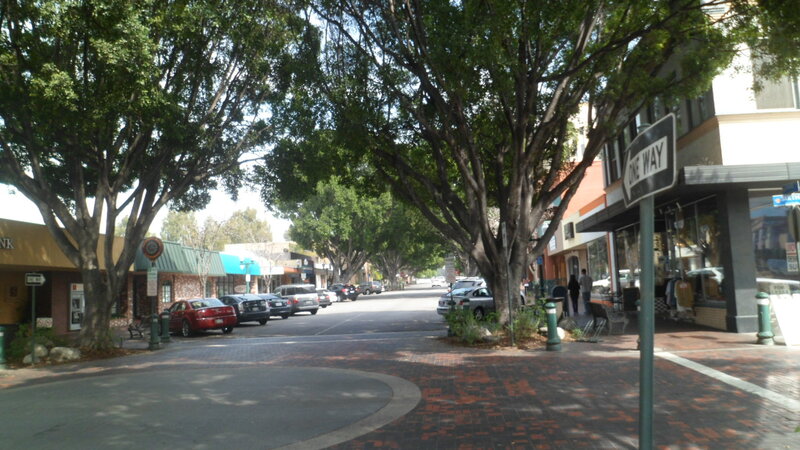 NEXT: Last, but not least, on my latest California jaunt, was Redlands. 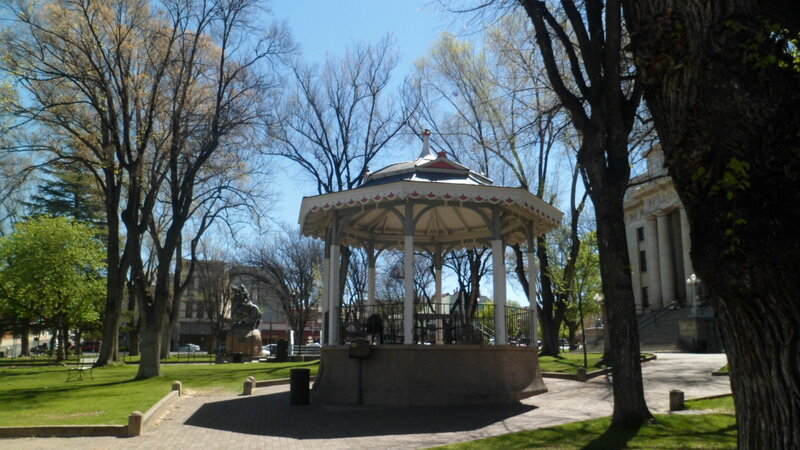 Prescott will observe the 150th anniversary of its founding, at the end of May. This afternoon, about 1,000 people gathered on the east side of the Courthouse, to take part in a group photo. Since I won’t be in town during the actual celebrations, I decided to be in the group photo. It’ll be ready for distribution, on a poster, in a few weeks. I will keep checking Prescott’s Facebook page for group photos, in the meantime. While contemplating the arrival of this anniversary, I realized that my photo shoots have been achieved far and wide, across the country, yet I had not recorded some of my adopted home town’s most salient features. Downtown is therefore presented here. First, at City Hall, citizen and visitor alike are greeted by this imposing figure. 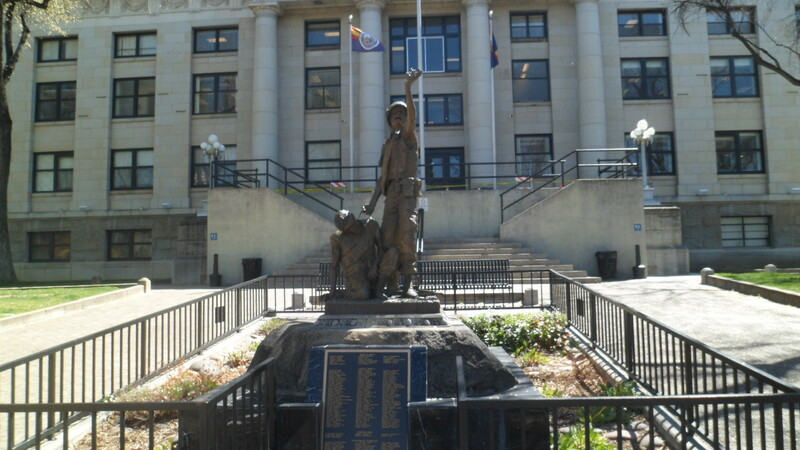 Two other statues occupy the edges of Courthouse Square. 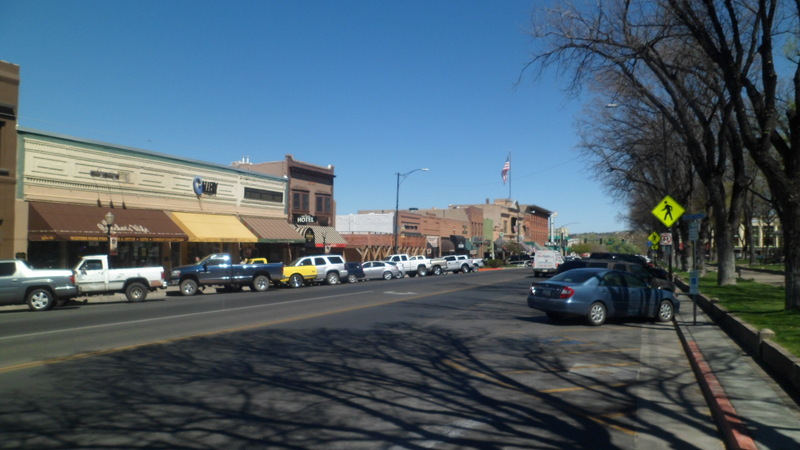 The warp and weft of this fabulous little town is the ranching West, followed closely by a fierce defense of individual freedom. 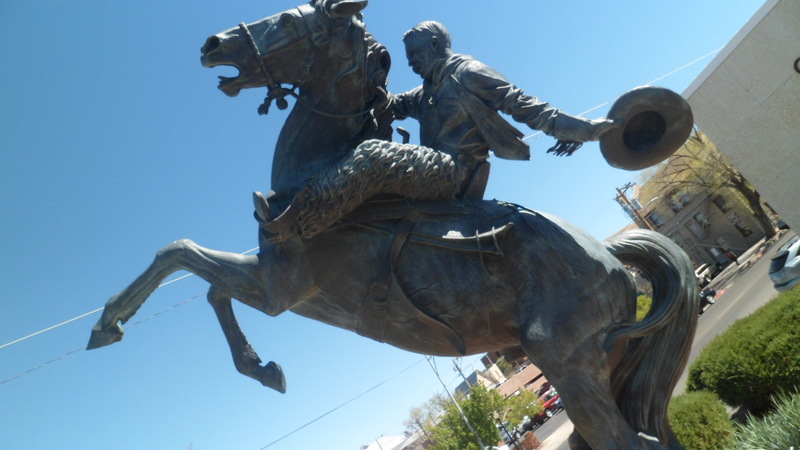 There is, in this day’s economy, not that much left of the Cowboy Culture, but we have the Fourth of July Rodeo, the Cowboy Poets gathering, these statues, and what follows- Whiskey Row, Prescott’s legendary answer to Tombstone. 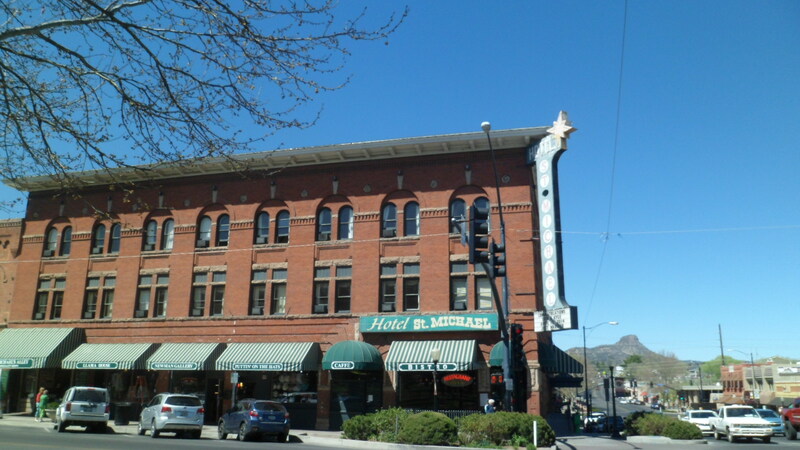 The northern cornerstone of Whiskey Row is the oldest of Prescott’s three iconic hotels: The St. Michaels. 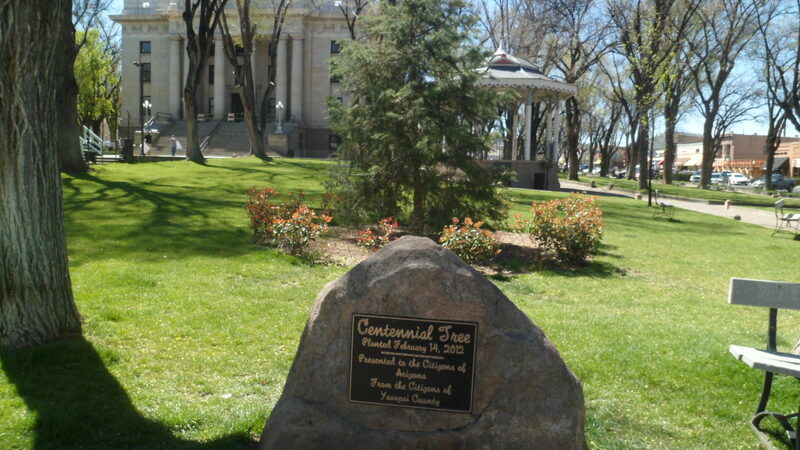 and found the Centennial Tree, offered by the people of Prescott to the State of Arizona, on February 14, 2012, our state’s Centenary. 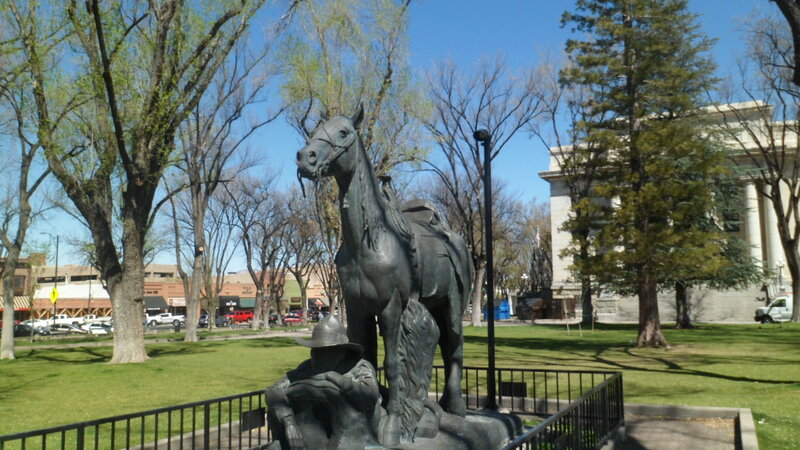 Prescott was founded for the sake of the cattle industry, as well as for mining. Yet, when the horse became a secondary means of transportation, Prescottonians took easily to the automobile. 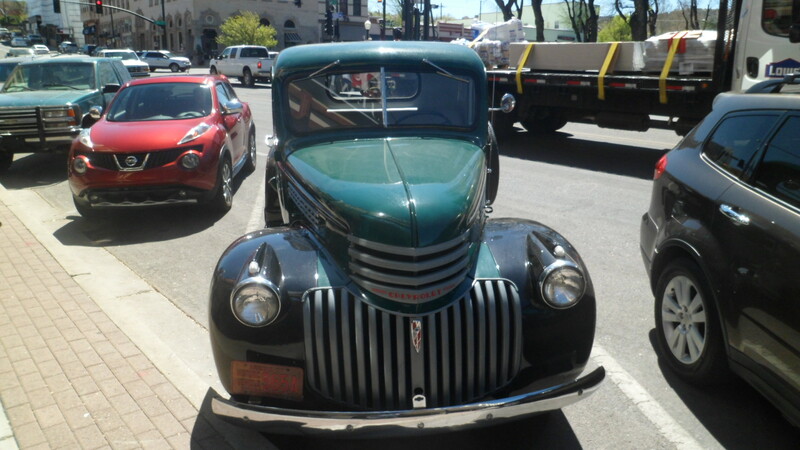 Antique car shows are held here, once or twice each year. 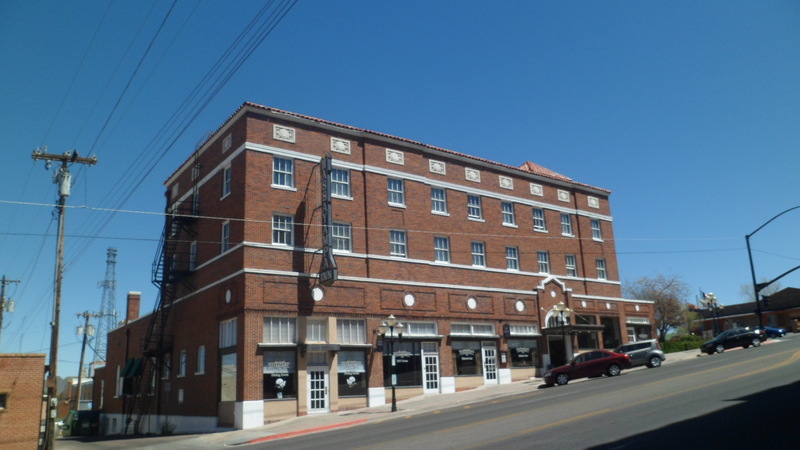 On the way home, I passed Prescott’s newer downtown Grand Hotel: The Hassayampa. born of the Edwardian Era. I can’t leave mention of hotels, though, without a glance at our lovely boutique establishment: The Vendome. 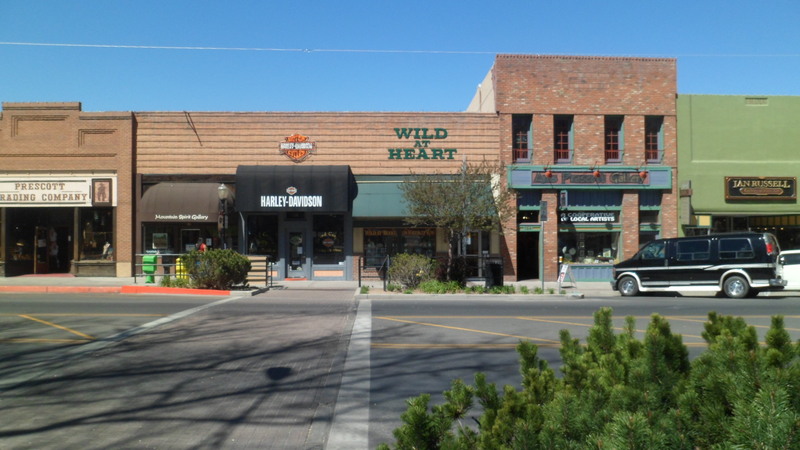 Prescott still has plenty of serene, natural settings, including some not far from downtown. 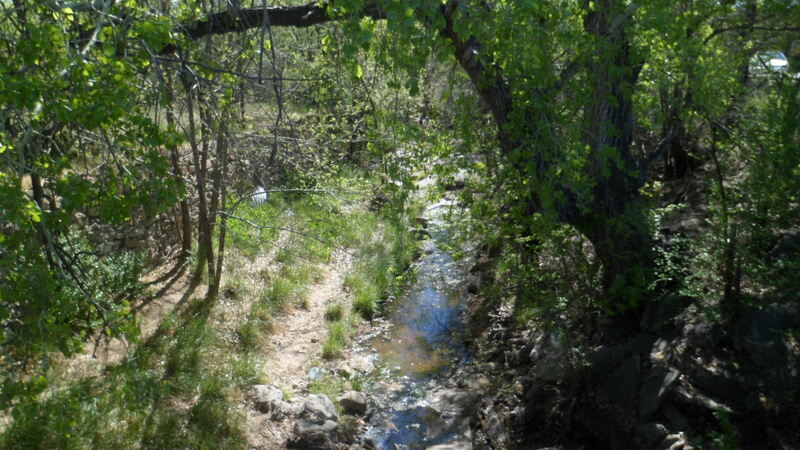 Here is Miller Creek. 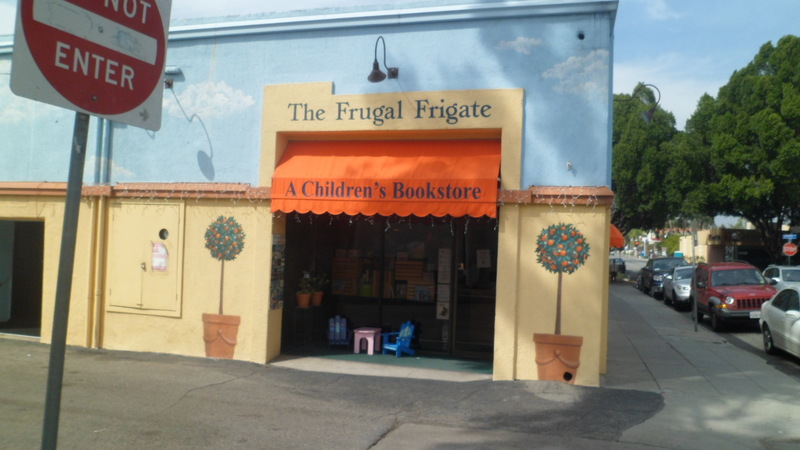 Here is an example of why Prescott has survived three downtown fires, a few floods and the devastation of last year’s loss of one of our primary Fire Crews. 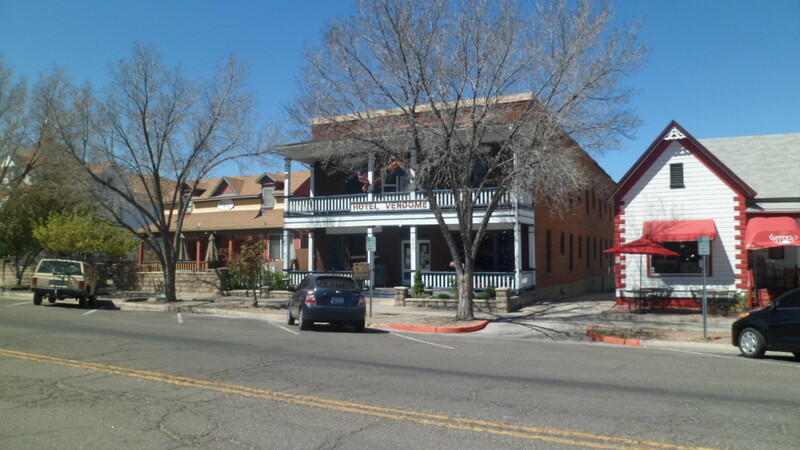 A real community is never totally rent asunder, and this town, like Tombstone, is too tough to die. 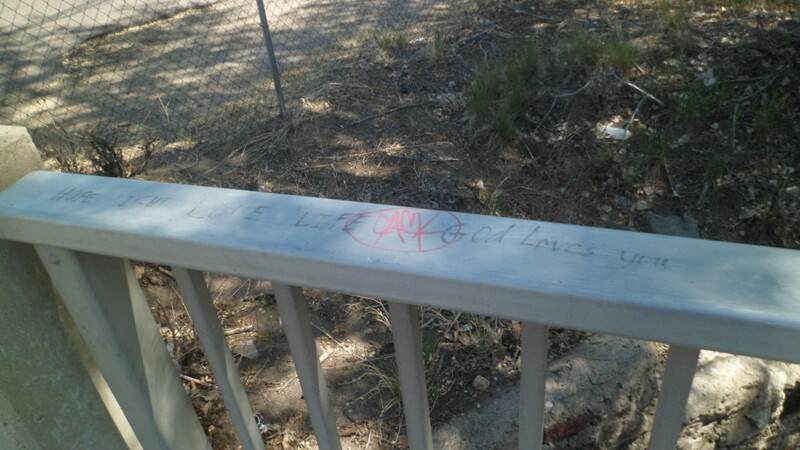 Long after the scrawler of the red graffiti has come to his senses, there will be love and life, and God will love us. 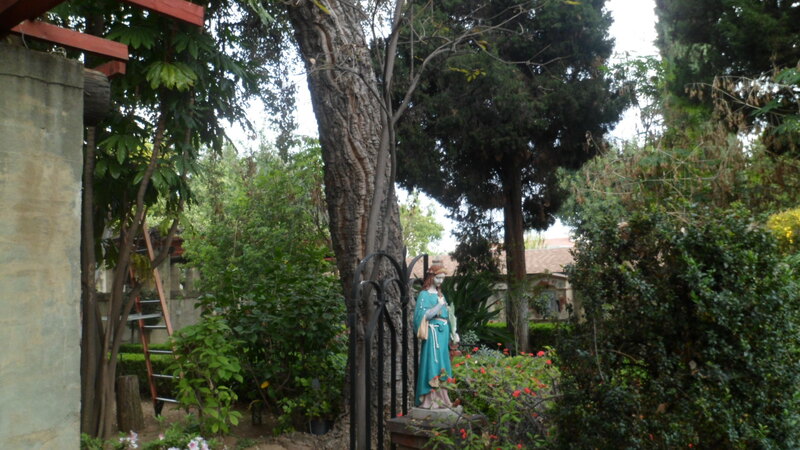 The serene inner garden of Mission San Gabriel Arcangel exists in four parts. 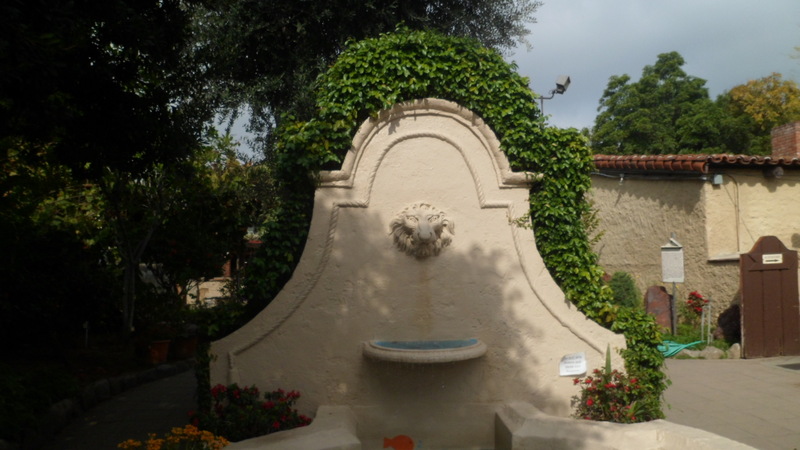 There are indeed four points in this lovely arrangement: The Grape Arbor; the manufactory; the Peace Garden; the Tongva display. 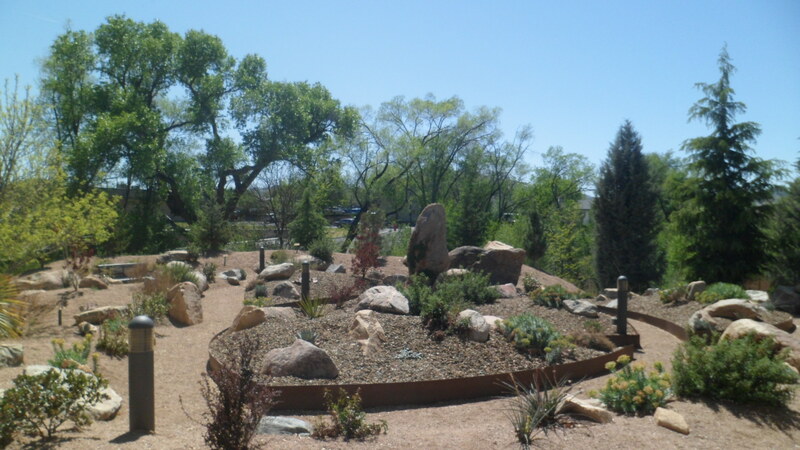 When entering the garden, through the Mission’s Museum Store, one encounters an area that links the four points of this amazing island of serenity. Here, it is explained how the big picture of Spanish settlement fit the work of the monks and friars into its warp and weft. 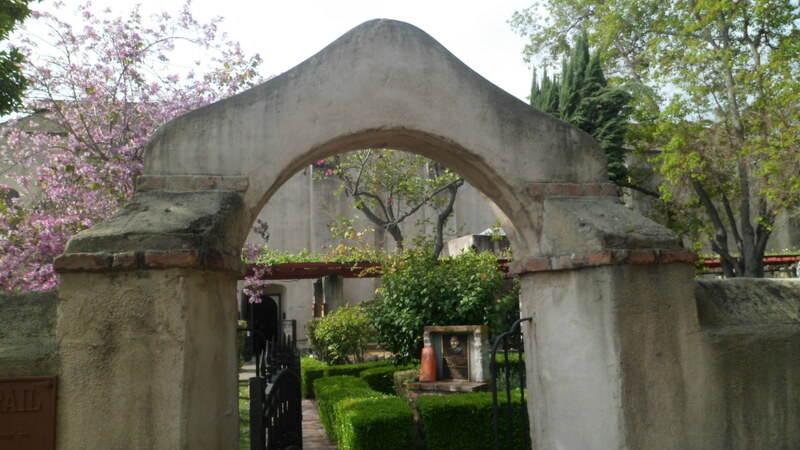 An archway brings the traveler into the Peace Garden. 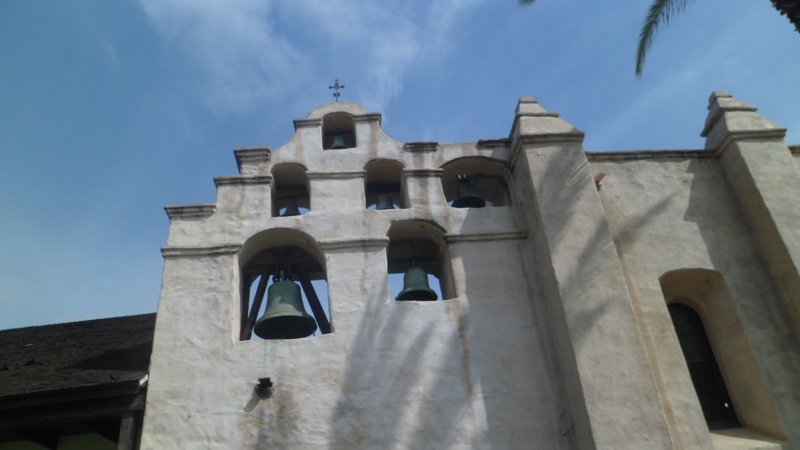 From here, it is wise to listen for any signs that there might be a Mass, or other worship activity, going on, as the Mission Church is immediately ahead, to the south. 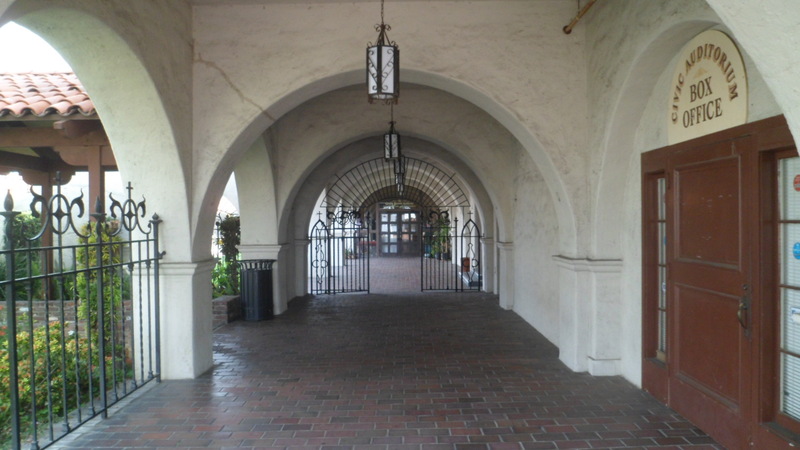 As Mass was in progress when I walked through the Archway, I contented myself with walking about in the Tongva quadrant. 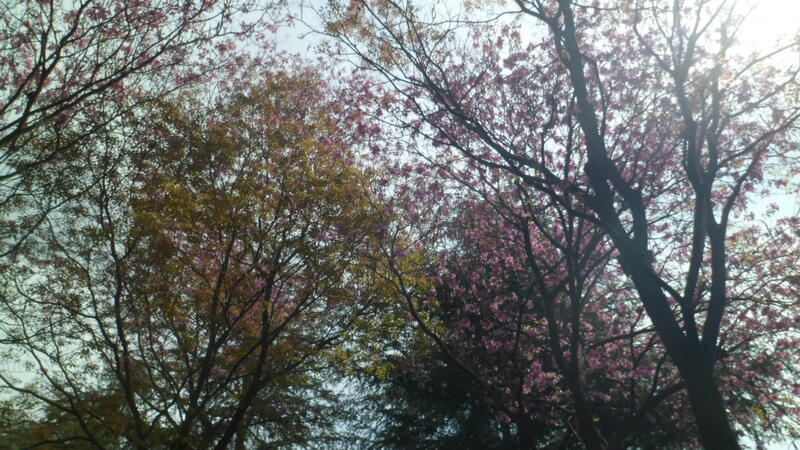 Cherry blossoms were abundant. A lion glared out from the fountain. 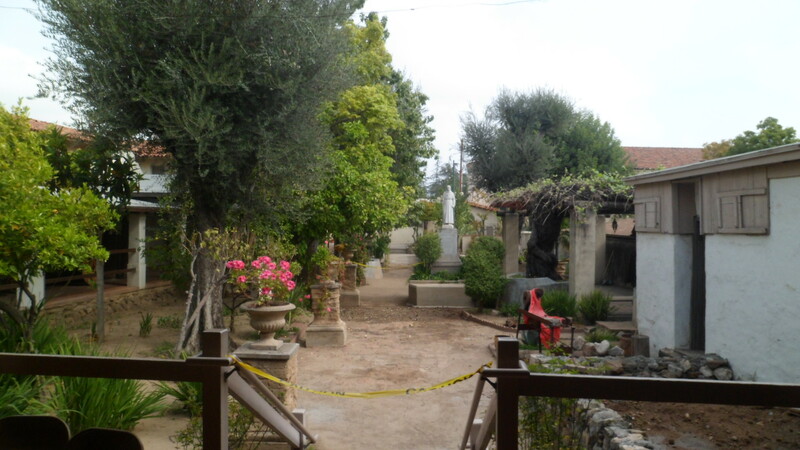 As was the case at the Playhouse, there is a full set of miniatures of the California missions, in this section of the garden. 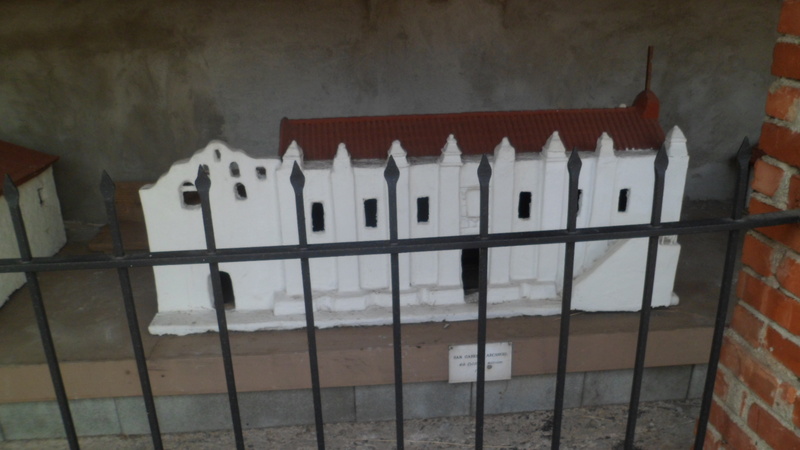 Here is a miniature of Mission San Gabriel Arcangel. 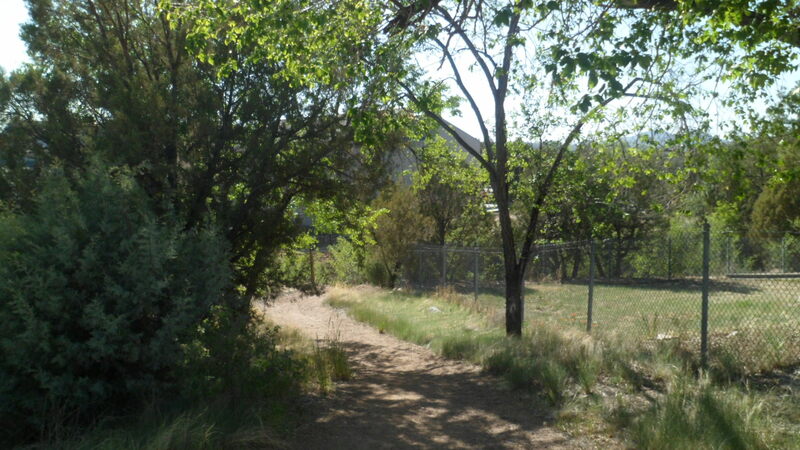 The garden path weaves in and out, through the various sectors. 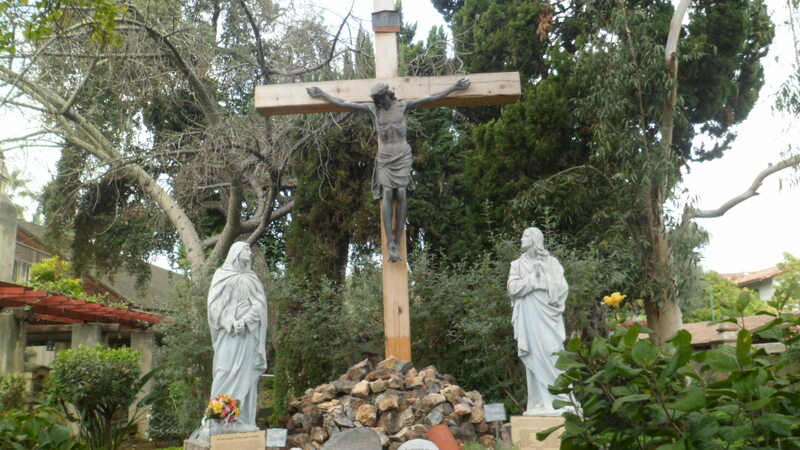 This area, for some reason, invoked Gethsemane, for me. 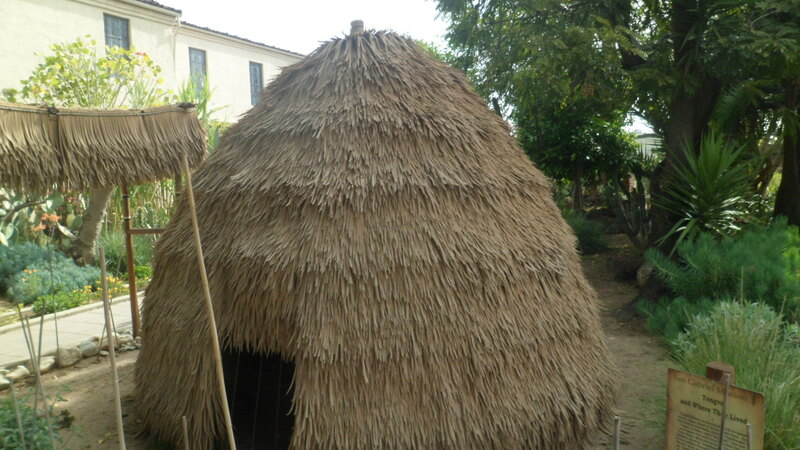 Around this corner, next to the bust of an unknown Spaniard, is the replica of a traditional home of the Tongva, or Gabrieleno, people. 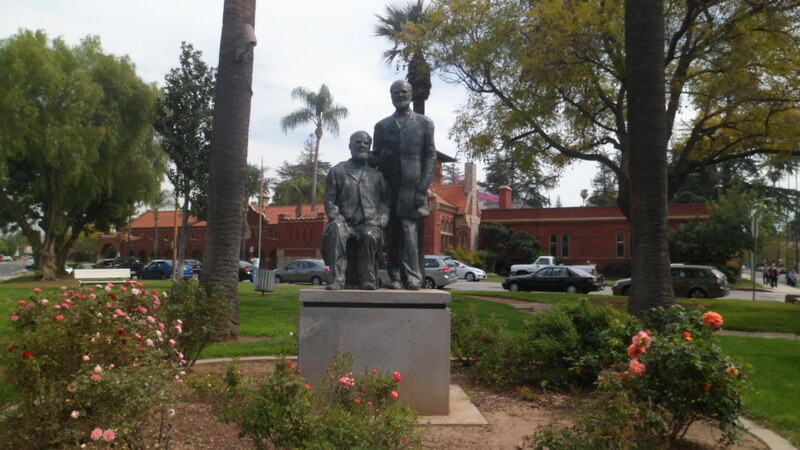 These indigenous folk dominated the Los Angeles Basin, from Malibu and Santa Monica to the area now called the Inland Empire. 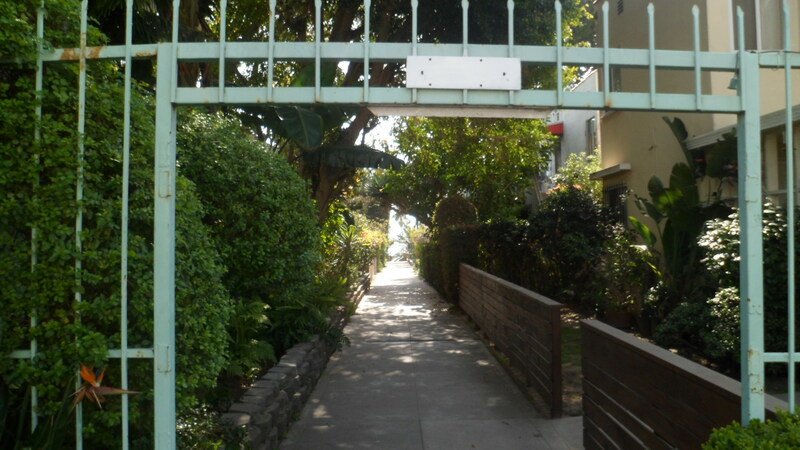 A band of Tongva still lives in San Gabriel, and shares the traditional culture with interested friends and neighbours. 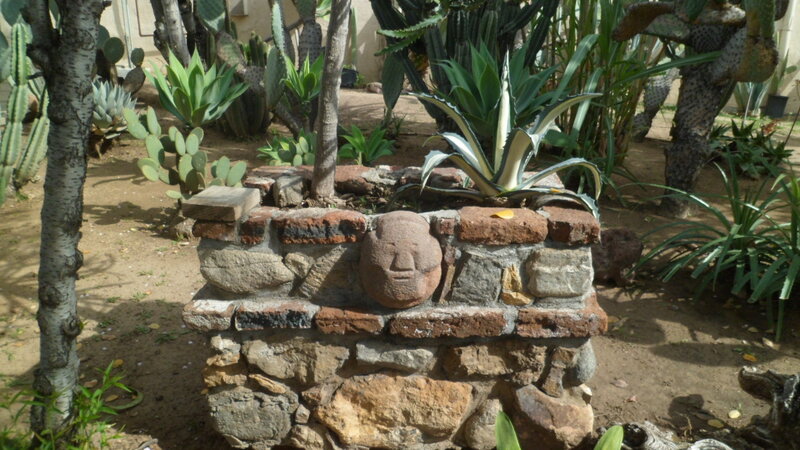 A Tongva image is featured on this nearby stone wall. 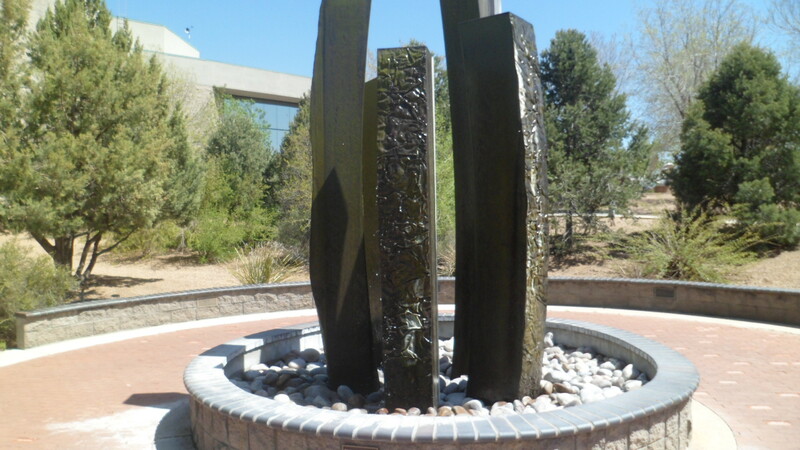 From the northwest, or Tongva, quadrant, I moved into the comforting realm of Peace Garden. The Blessed Mother, Christ and His Stations are here, bringing into focus the closeness that God and His Messengers are always willing to have with each of us, provided we open the channel. 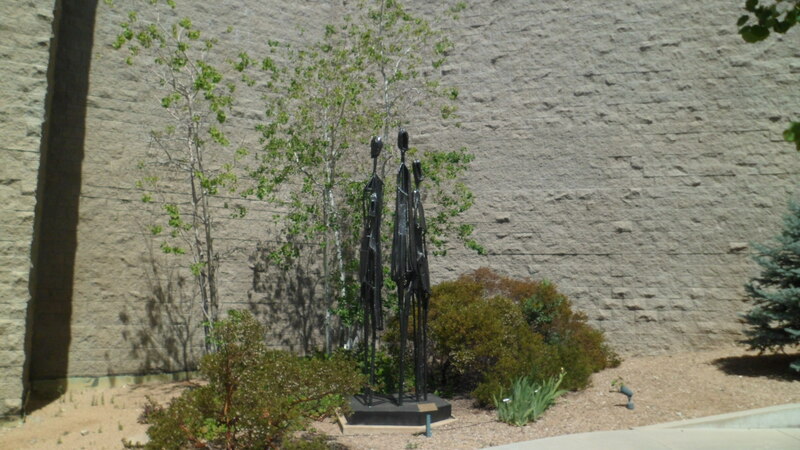 Mary’s countenance gives solace in two places within the Peace Garden. 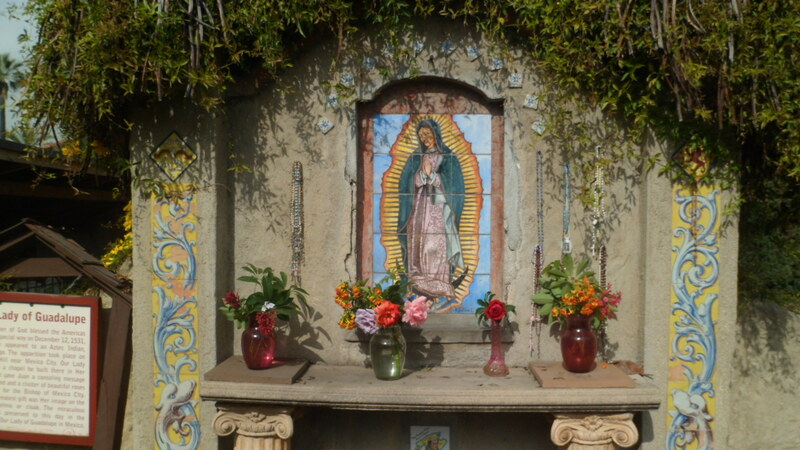 Here, she is addressed as Our Lady of Guadalupe. The Passion of Christ is reflected in the illustrations of His Stations, such as that below. All the more so, Christ’s Presence is felt, in this depiction of the Crucifixion. 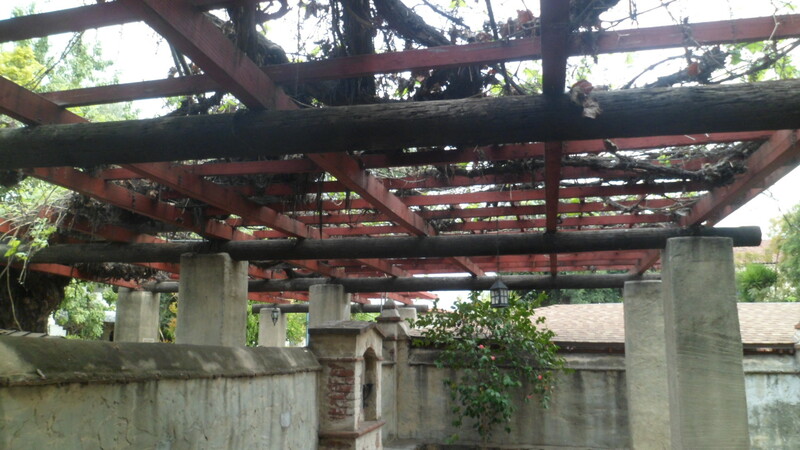 There is a very quick transition from the Crucifix to the Grape Arbor. 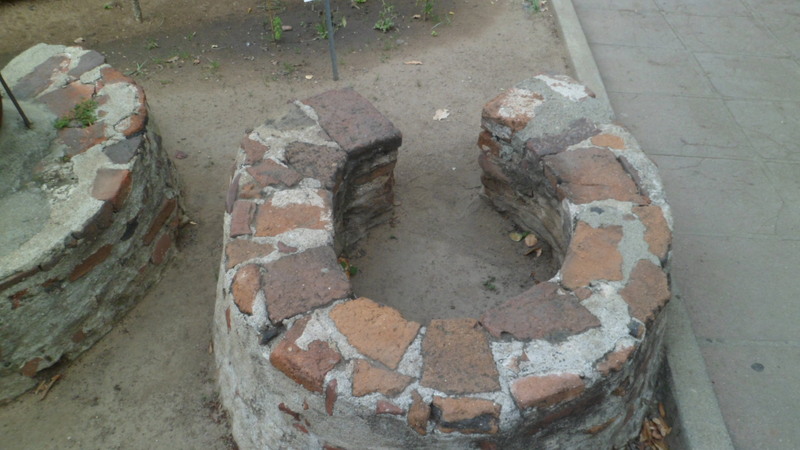 This small area represents the first winery in the Los Angeles Basin. The monks initiated grape cultivation, at first to provide ceremonial wine to be used at Mass. As with all such libations, however, pleasurable uses soon proved an incentive for wider cultivation. 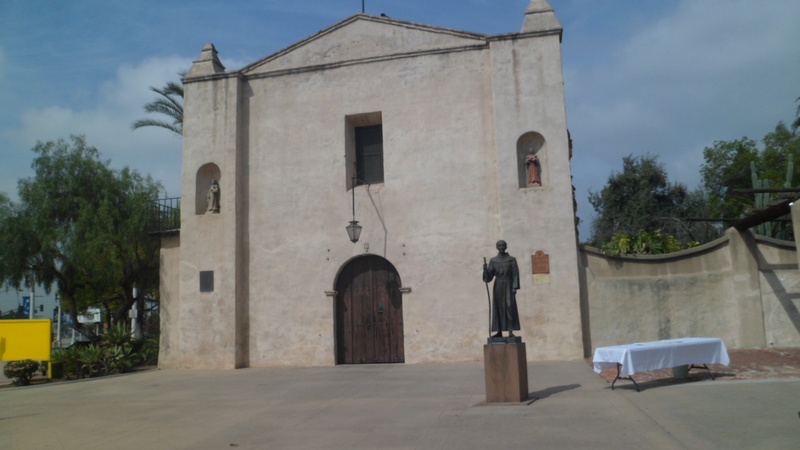 Padre Junipero Serra’s statue greets us here as well. 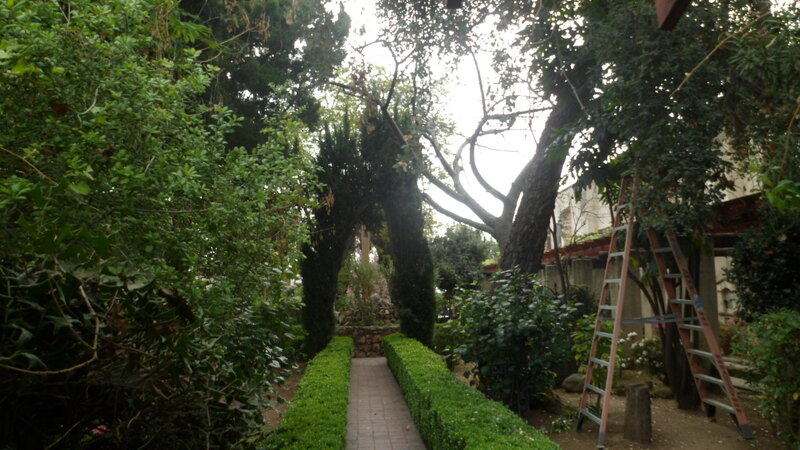 Through the Cypress Arch, one is escorted into the workaday realm of the Manufactory, the northeast quadrant. Here, tallow soap, candles and everyday implements needed by the Mission were crafted, as well as all cooked food prepared. 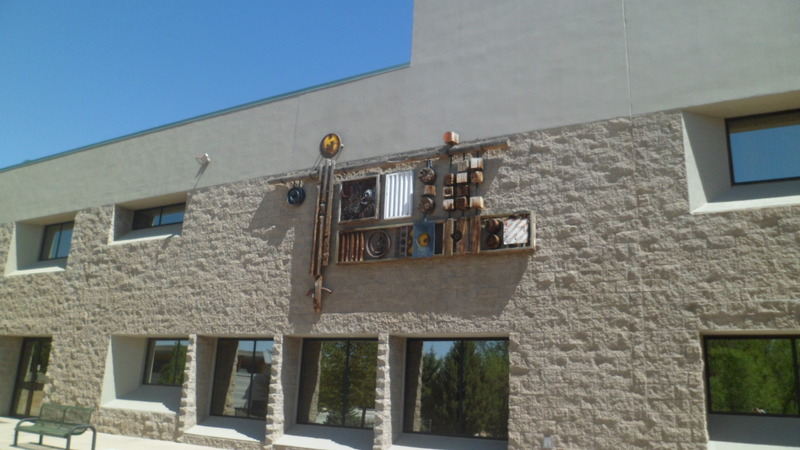 Below, here is a view of the outdoor ovens. 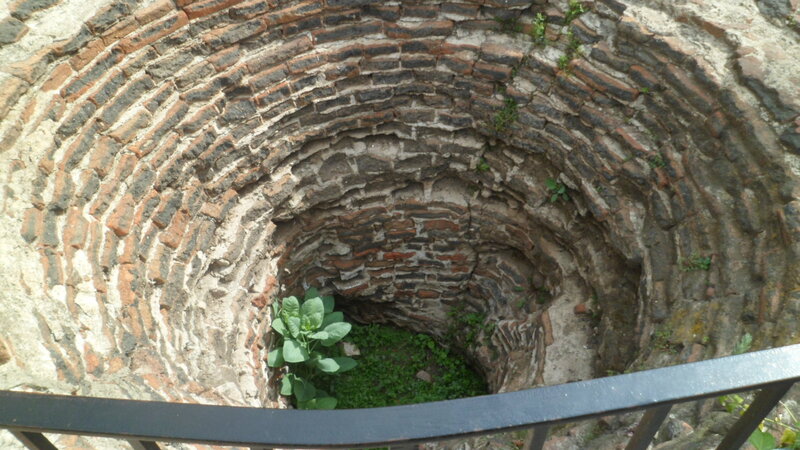 The aqueduct was fashioned from similar brick and mortar. 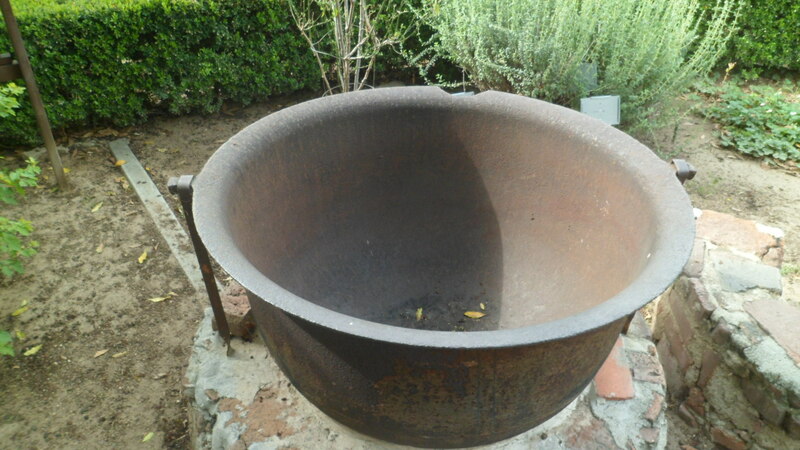 This iron cauldron was essential to the life of the community. So, of course, were soap and candles, fashioned from animal tallow, in vats such as this one. With the heat inside close to 450F, woe betided the careless and unwary of those venturing into the Manufactory. Making the necessities of life was quite hazardous. Life in this mission, as in other such communities, was however,generally rewarding for those of good heart. 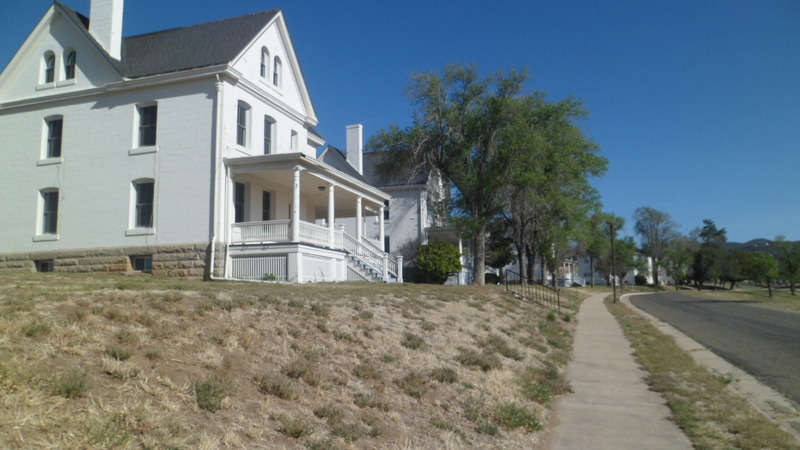 Control of the property was batted back and forth, especially after California’s admission into the Union, in 1850. 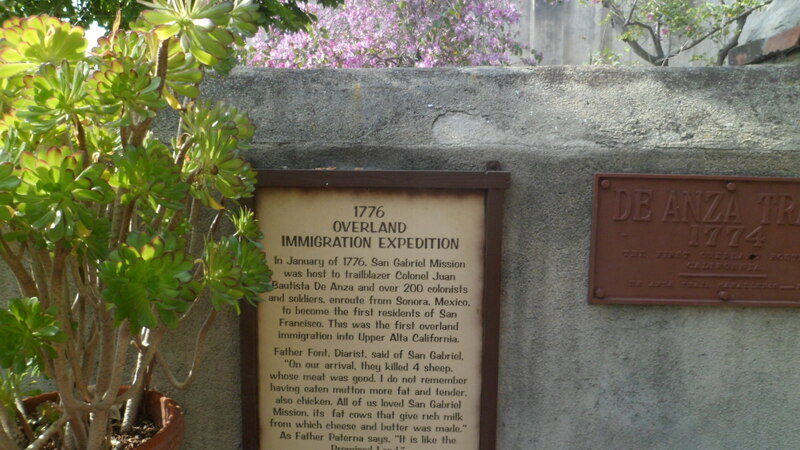 By 183, however, the Federal government had restored control of the Mission to the Claretian Order. 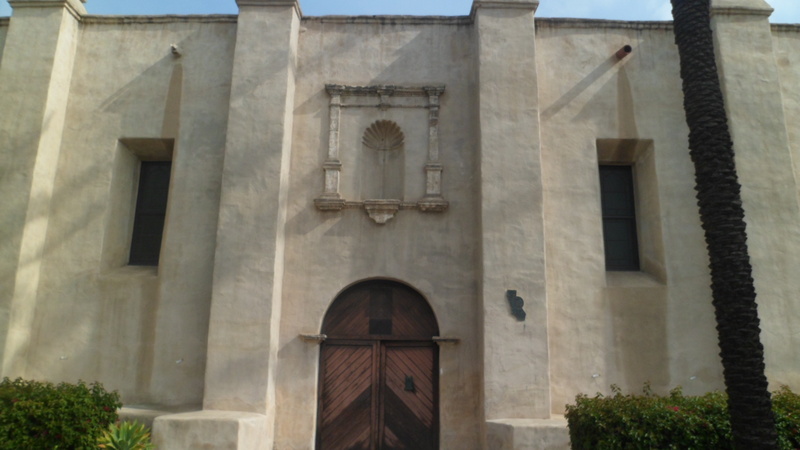 On Easter, I will post scenes of the Mission Church, the Parish Church and Mission School buildings. 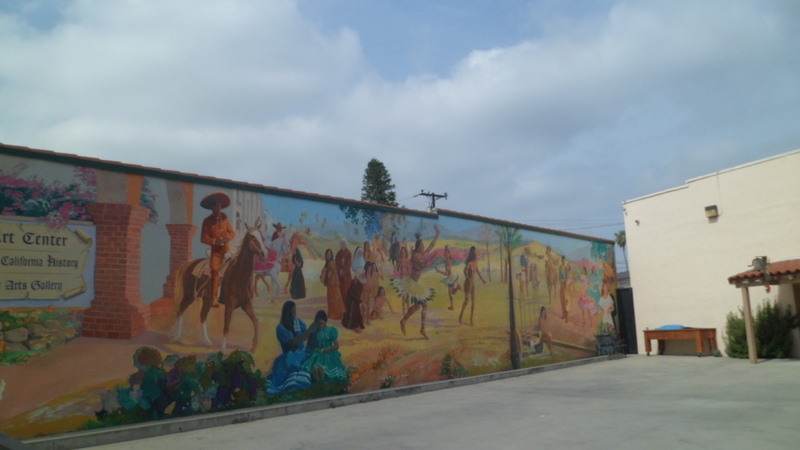 San Gabriel, in its heyday, was one of the most important settlements in the Los Angeles Basin, both to the Tongva people who dominated the area from Malibu to San Bernardino, and to the Spanish interlopers who saw Alta California as the next Golden Paradise. 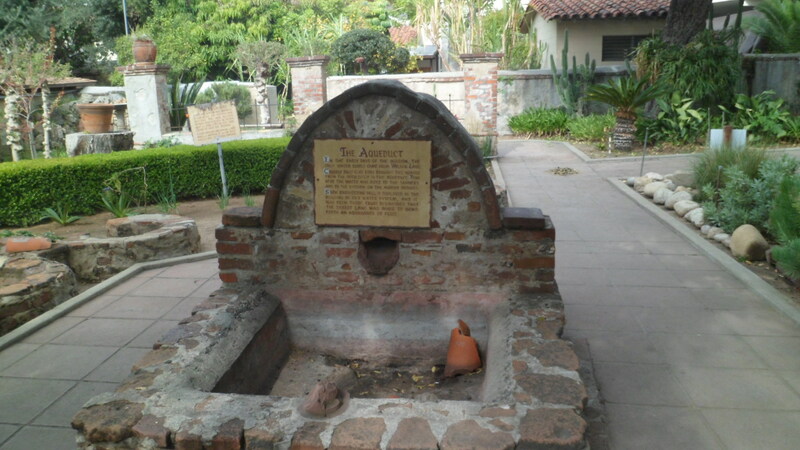 Mission San Gabriel Arcangel was the most important way station between San Diego de Alcala and Santa Barbara. 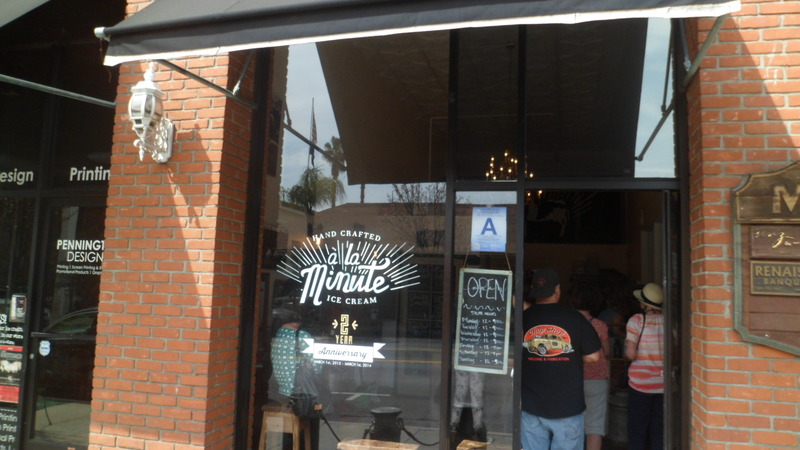 I spent about three hours on Sunday, March 23, in the Mission District of this still fascinating town on the eastern edge of Los Angeles County. 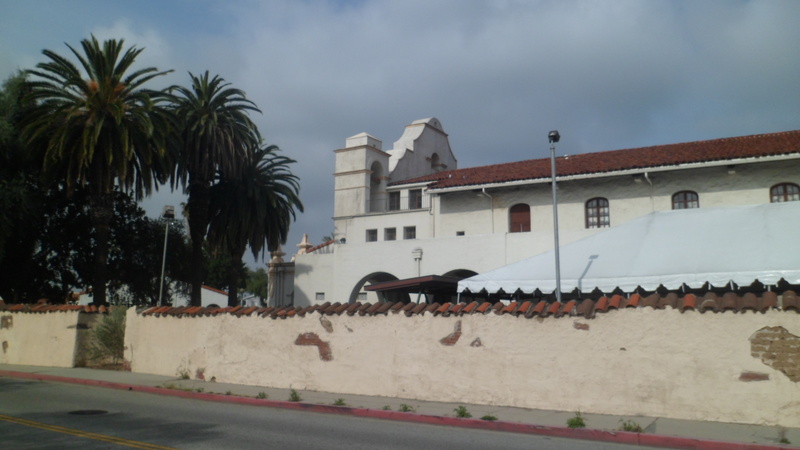 The arts have become full partners with the lovely and still vibrant Mission, in calling attention to San Gabriel. 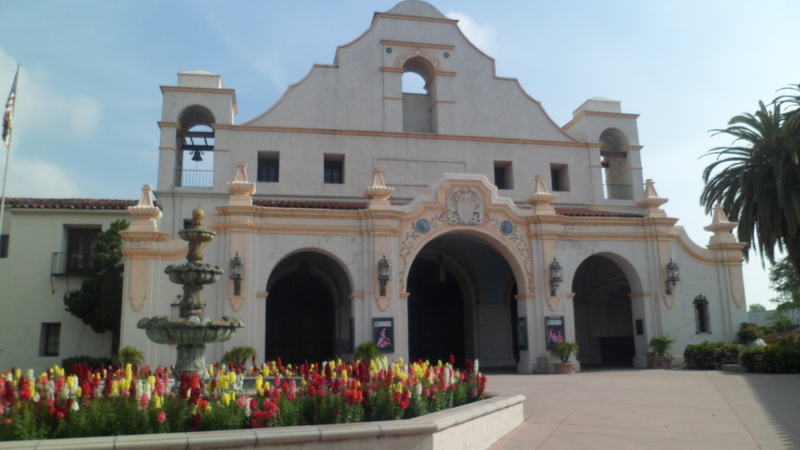 This post focuses on the Mission Playhouse, now San Gabriel Civic Auditorium, and the other buildings immediately to the west of the Mission itself. 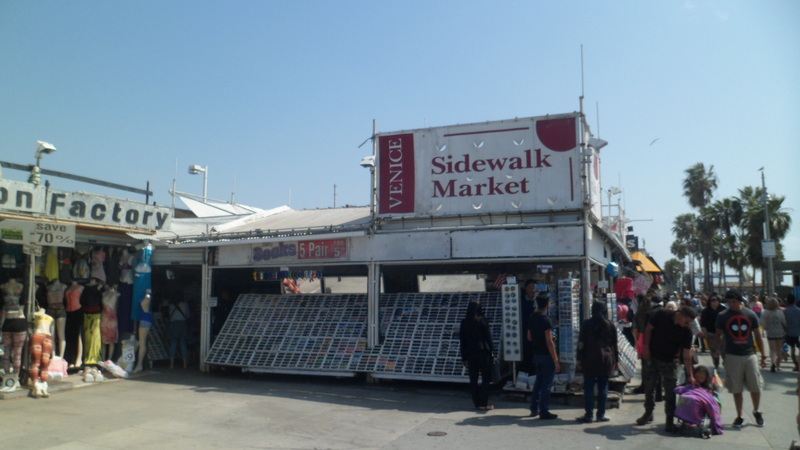 I arrived here about 10 A.M., after a brisk stretch-walk from El Monte to Rosemead and back, about a two-mile rounder. 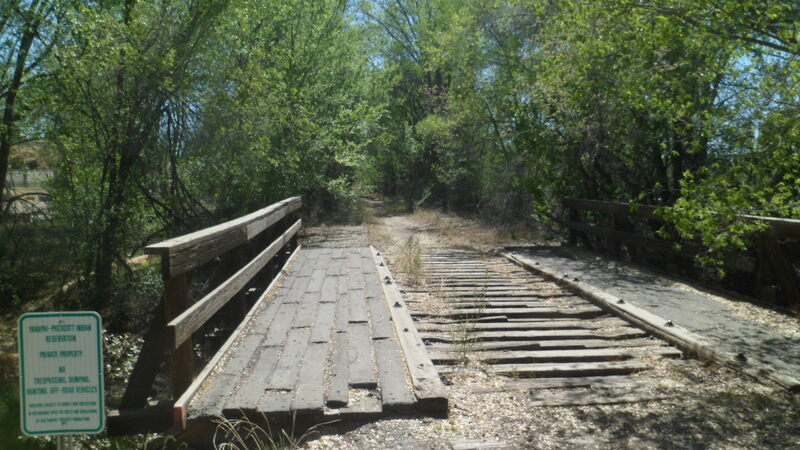 Not much was happening there, but San Gabriel was my goal for the morning, anyway. The Playhouse itself was closed, of course. 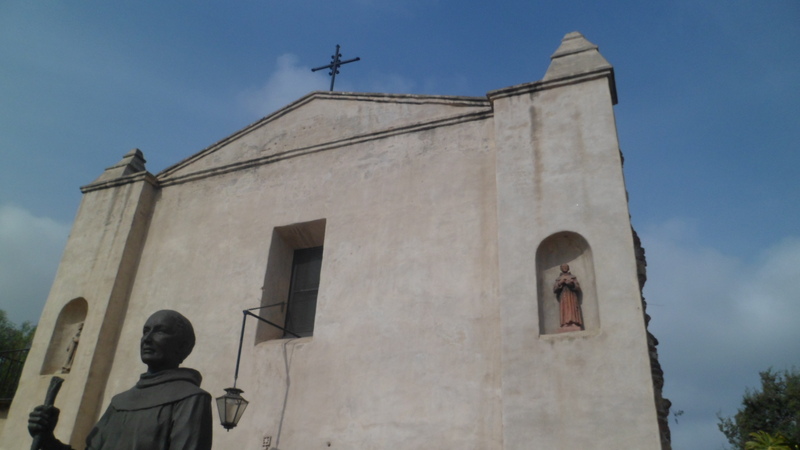 Who goes to plays on Sunday morning, even if they are about Padre Eusebio Kino? I was treated to some lovely scenes, though. 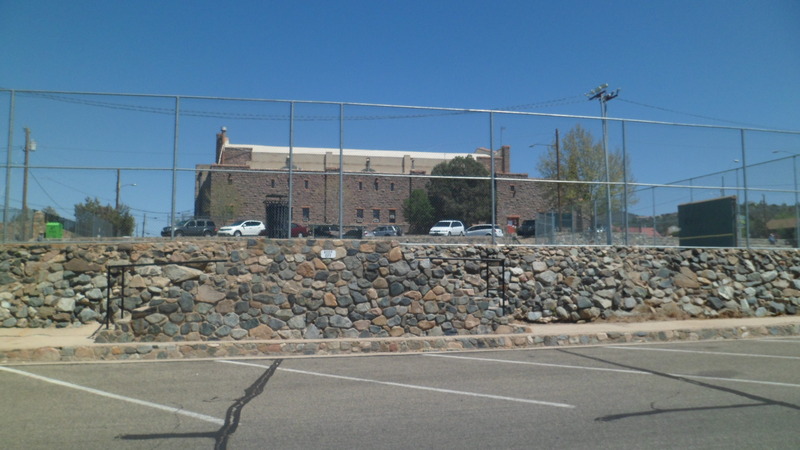 Here are views of the grounds, and of the imposing edifice. 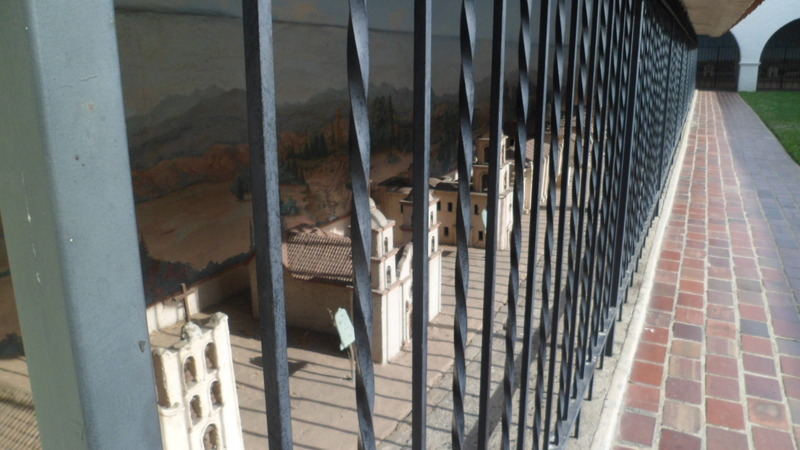 Both the Civic Auditorium and Mission San Gabriel itself have miniature exhibits of all the coastal missions in Alta California. As with so much decorative art, one must never neglect a view of the doors. Those found here, are second to none. 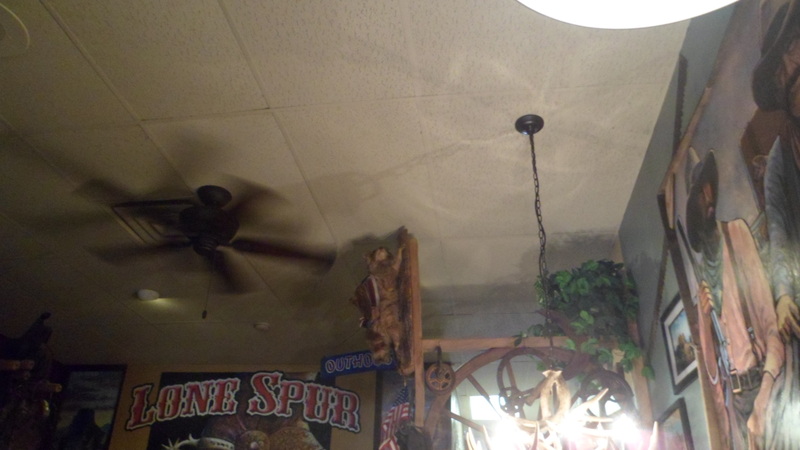 Nor should we overlook the ceiling! 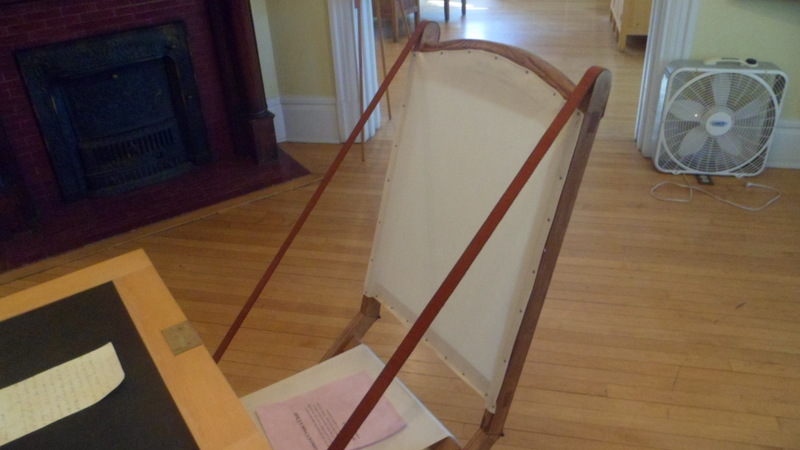 This painted design is more modern, of course. 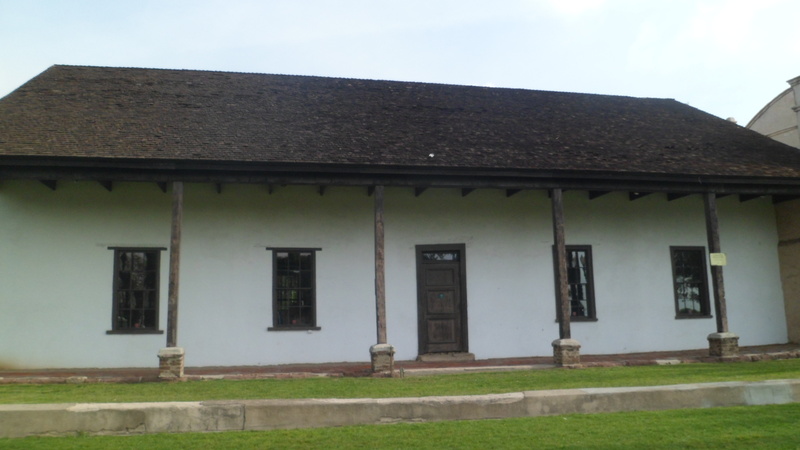 The Spaniards opted for wooden beams and other, more simple fare. 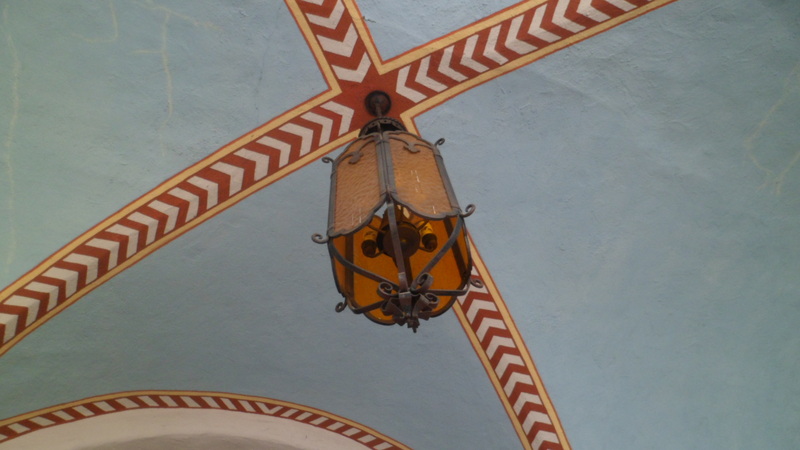 The alcoves are among my favourite parts of the missions. 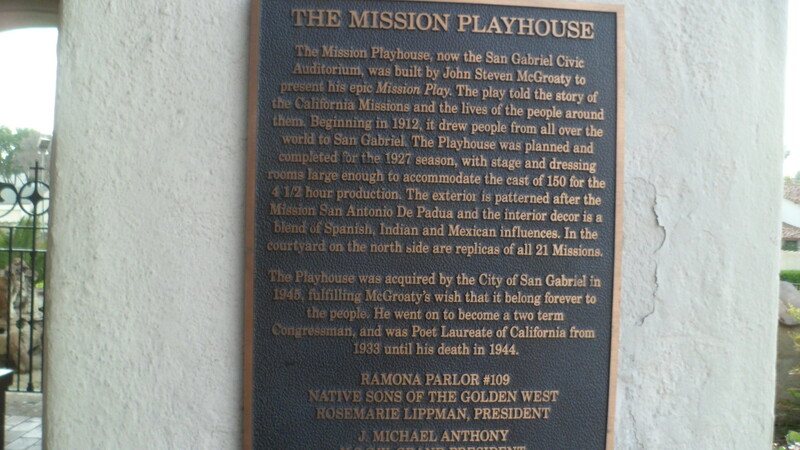 The full story of the Playhouse, and its transfer to the City of San Gabriel, is told here. 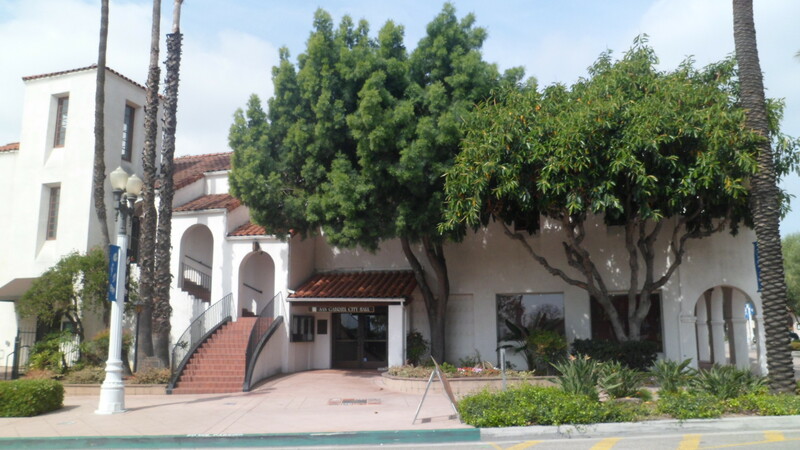 Grapevine Park is part of San Gabriel Senior Center now, and as such is only open during the week. 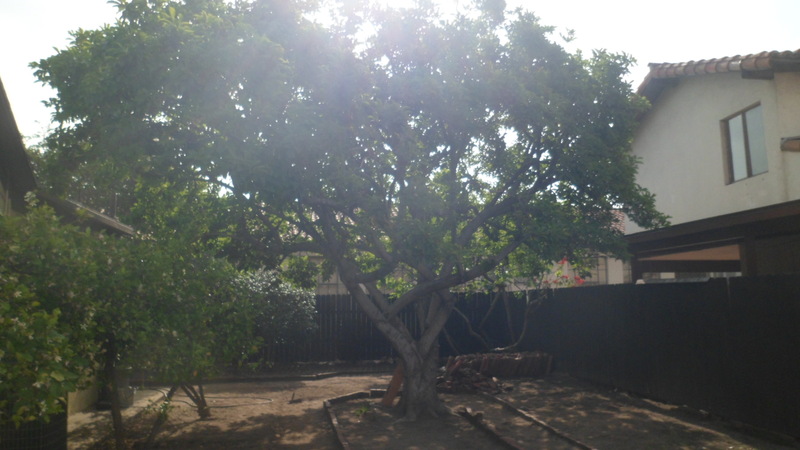 It has one of the original grapevines which helped defray the costs of the Mission. 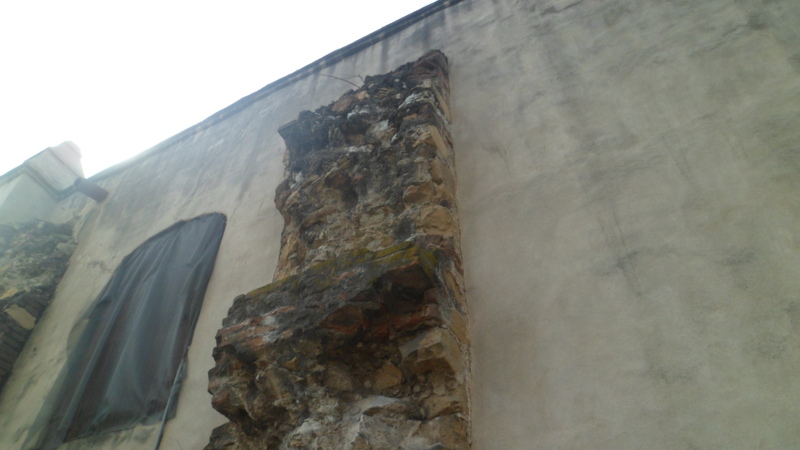 The walls protected the privacy of the friars, back when this was part of the mission proper. Today, they keep Mom and Pop safe from prying eyes. 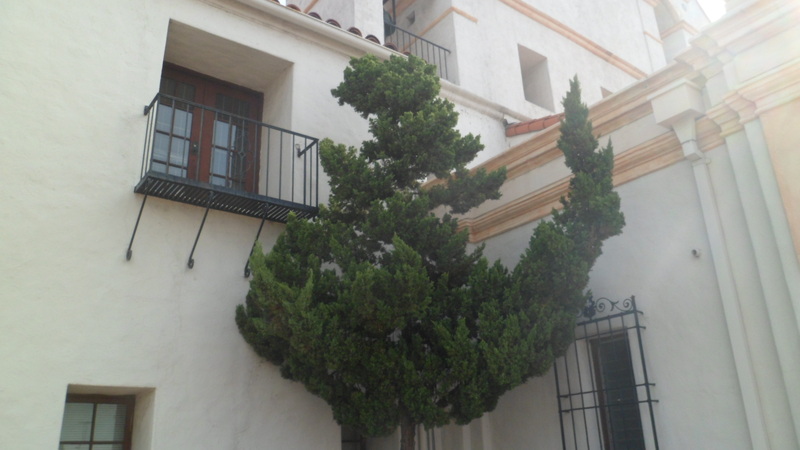 There is a spot, though, where one is able to get a good view of the California Live Oak, on the Playhouse grounds. 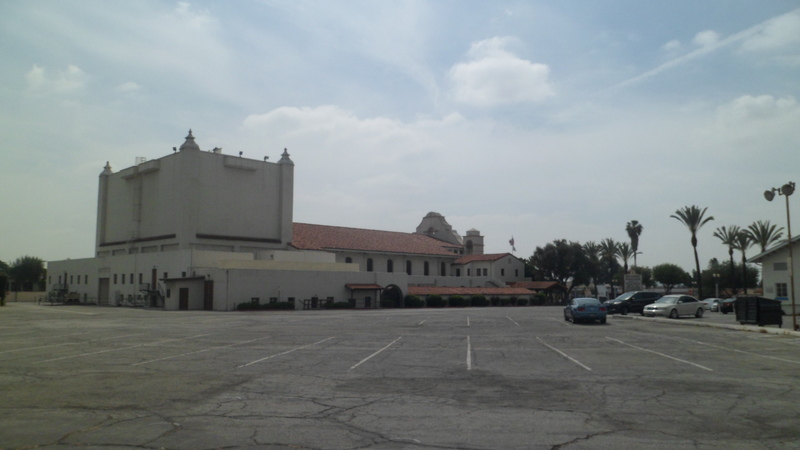 Here is one last view of San Gabriel Civic Auditorium, from the northwest. 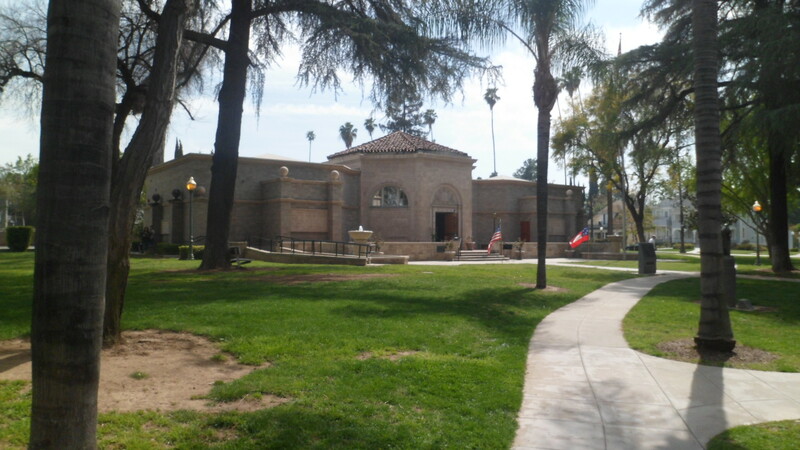 Across the street from the old playhouse lies San Gabriel City Hall, built in 1914, in the Spanish Colonial style, on the grounds of the area’s Grist Mill. 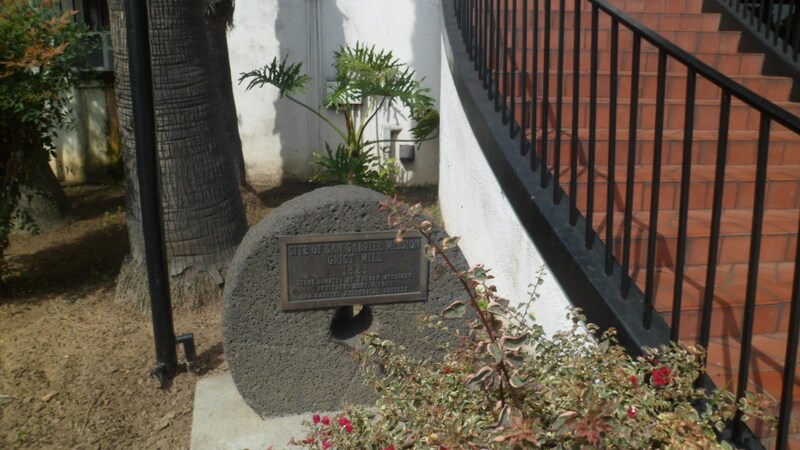 Adjacent to City Hall is the Ramona Museum of California History. It’s open from 1-4 PM on Saturdays, but the mural is there, 24/7. 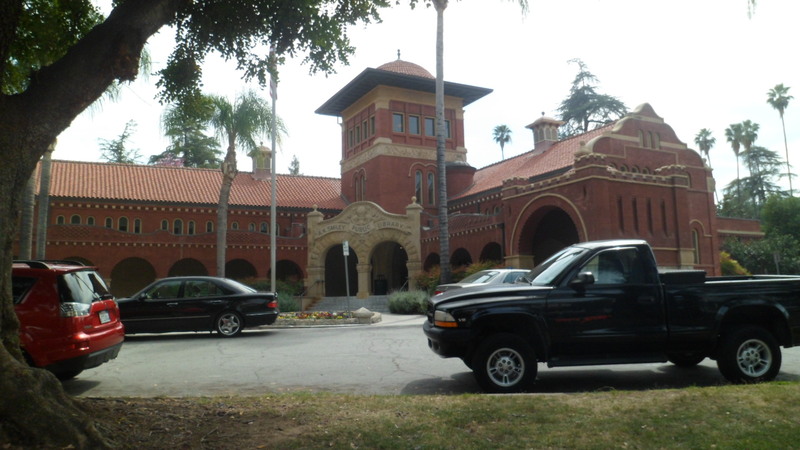 North of the Civic Auditorium lies Bovard-Wilson-Hayes House, home to the area’s first Anglo-Californian settlers. 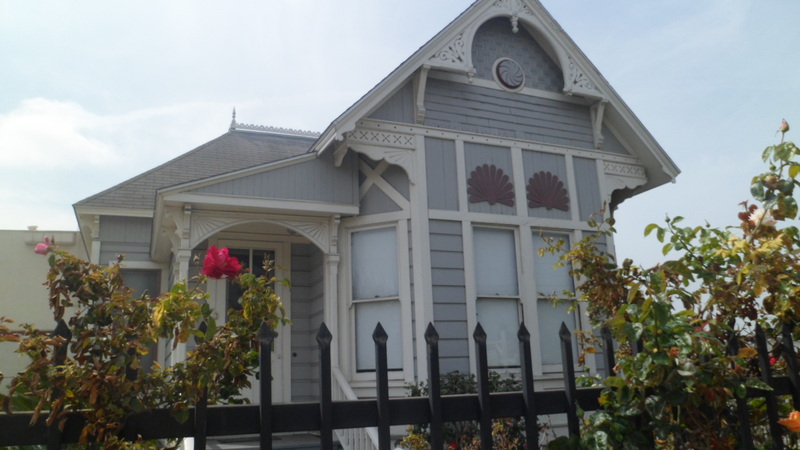 Reverend George Bovard, the first resident of this 1887 Victorian, was the fourth President of the University of Southern California. 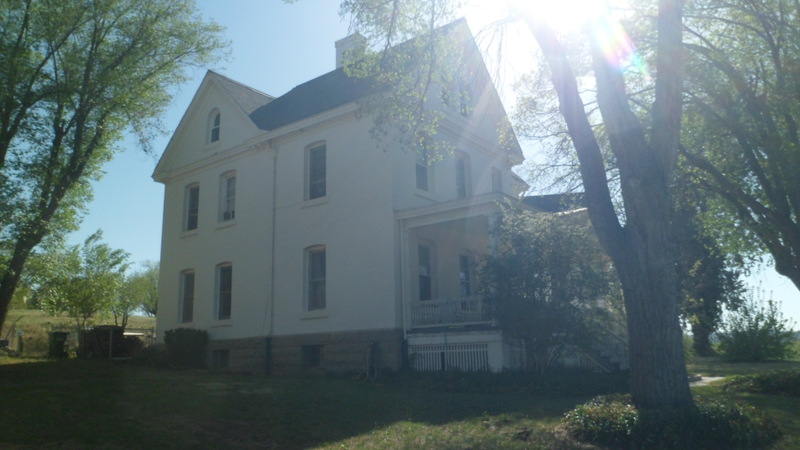 When he moved to Pasadena, Judge Milton S. Wilson purchased this house. Judge Wilson’s granddaughter, Mary Ruth Hayes, inherited the home and served as a school teacher in San Gabriel, for many years. 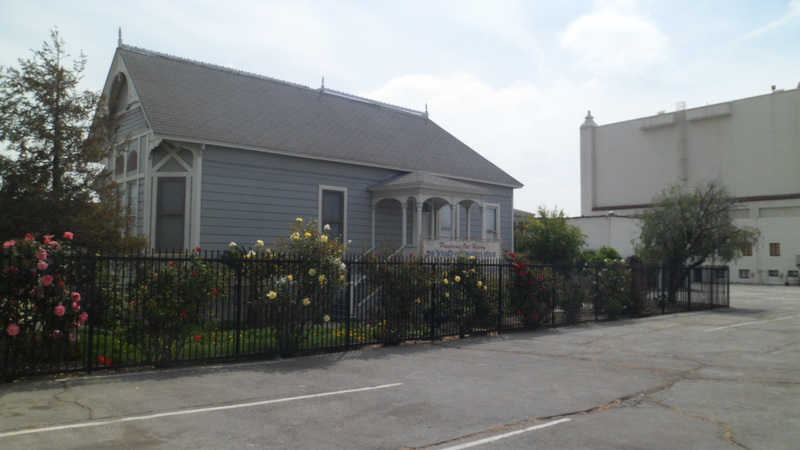 When she passed on, in 1990, her will deeded the house to the San Gabriel Historical Association. 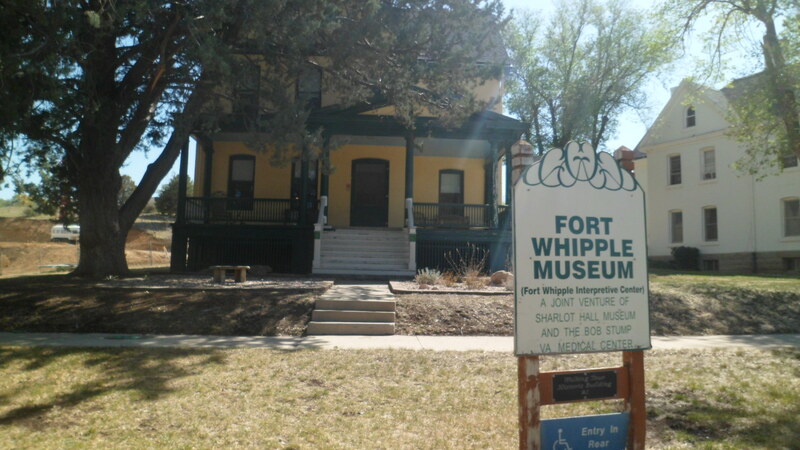 The house is open to the public on the first Saturday of each month, from 1-4 PM. So, it looks like I will need to pencil in a First Saturday afternoon in San Gabriel, at some point. 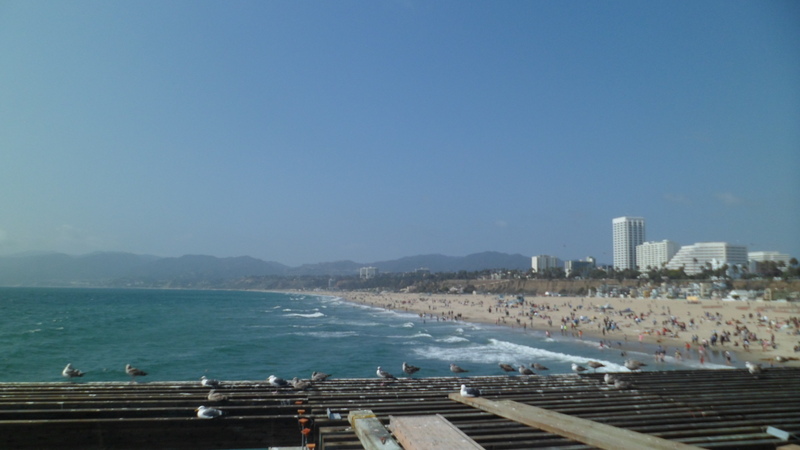 Santa Monica exists in at least three different forms: UCLA and its attendant cultural features; the beach and its hotel/condo appendages and the Pier, with all that goes in, under and around its overarching presence. I came here, to the end of Rte. 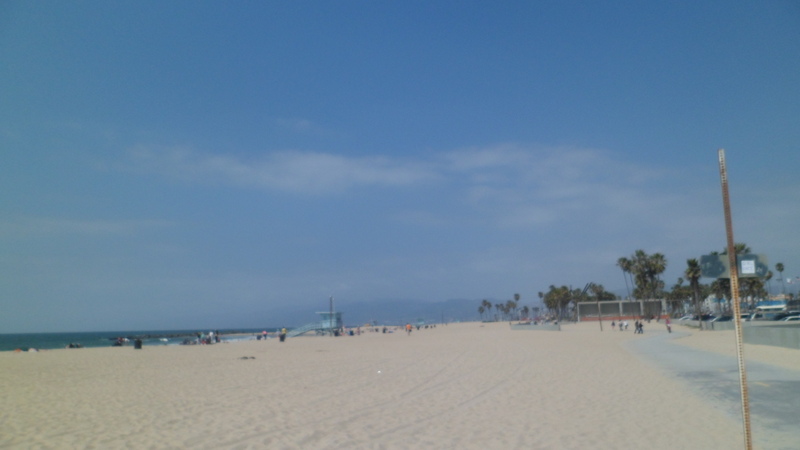 66, the beginning of I-10, and another few stops on the Pacific Coast Highway, just as a most respectable conglomerate of human beings had settled in for a day’s excitement at Pacific Park. 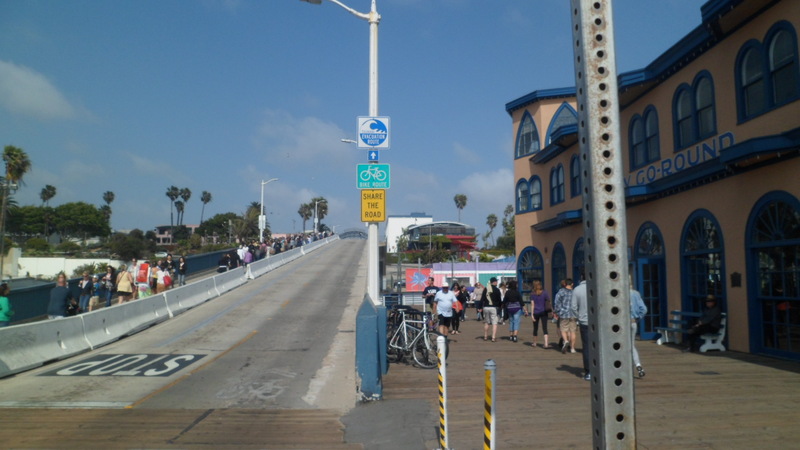 Except for my jaunt over the pedestrian part of the bridge to downtown, however, I not once felt crowded. There seemed to be a fairly even distribution among the various parts of this particular land’s end. 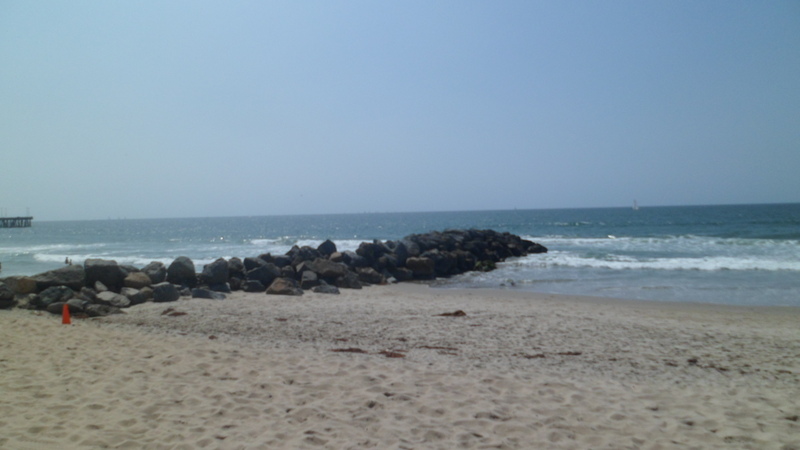 As always in a coastal town, I started my visit on the beach. 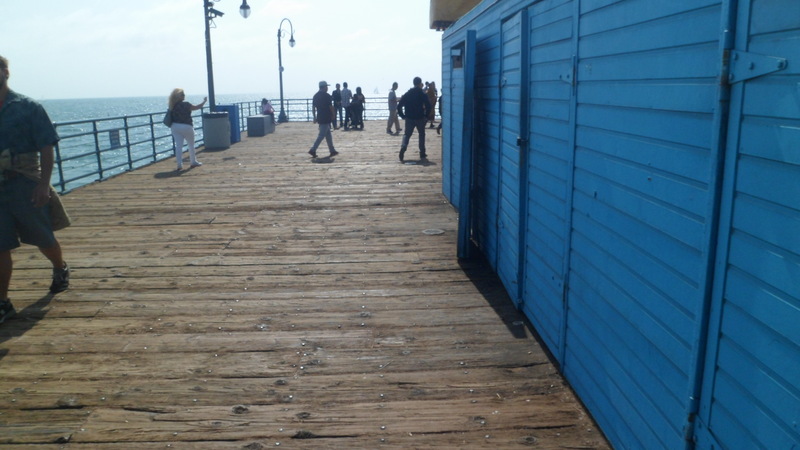 It was nearly deserted on this end, but there would be a fair number sunning themselves, closer to the Pier. 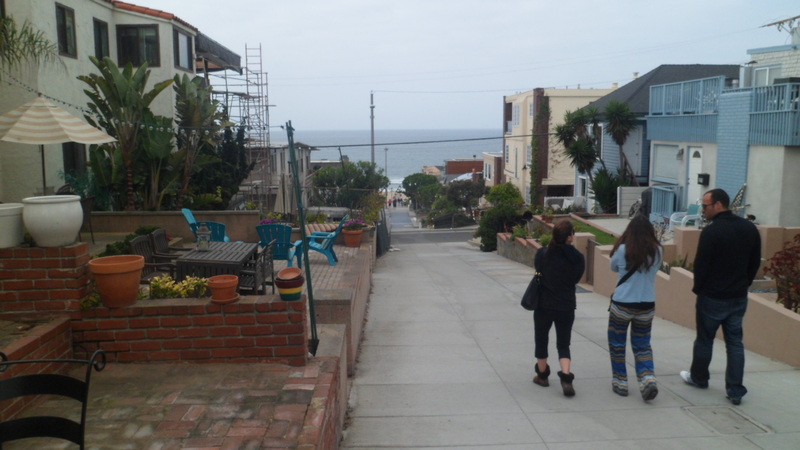 Still, the hotel/condo area, east of the beach, looked well-peopled. 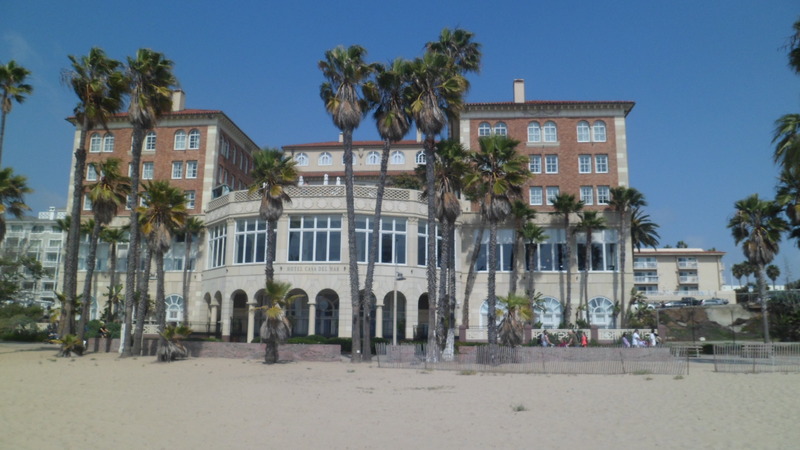 Casa del Mar is a bit rich for my blood, yet, but like other venerable places, would be worth exploring its lobby and grounds at some point. 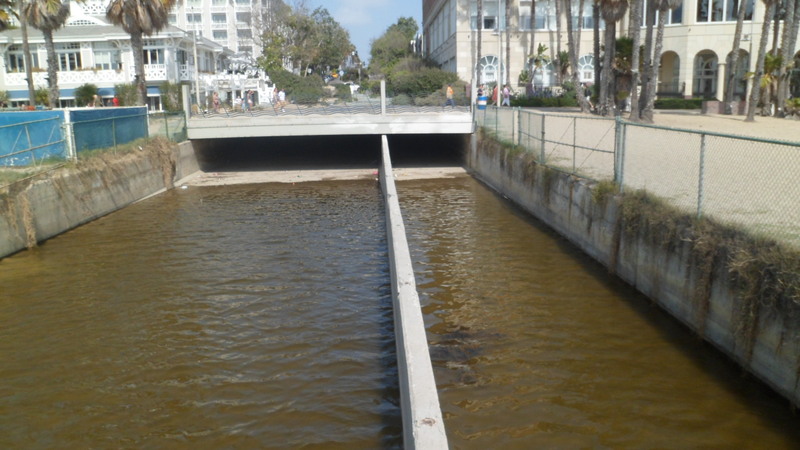 Another feature of west LA that I’d like to spend a day on, is the canal system. 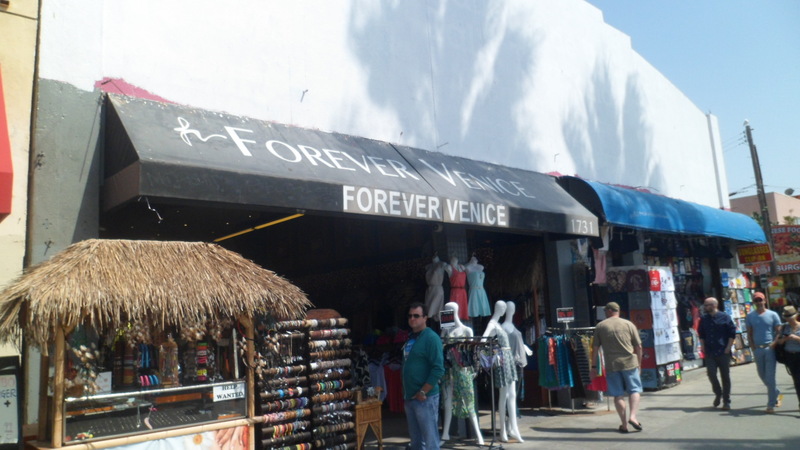 Venice has more, in keeping with its eponymity to the grand Italian city, but this one in Santa Monica has a certain sweep to it. 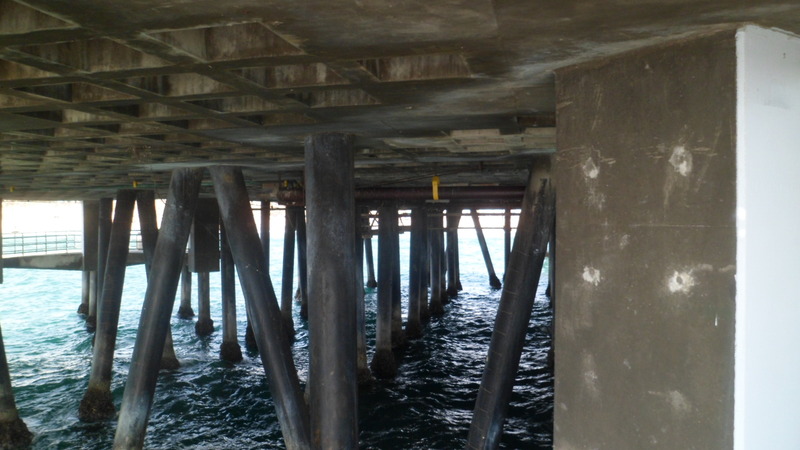 After trekking across what seemed as desolate as the Sahara, I came upon- THE PIER! 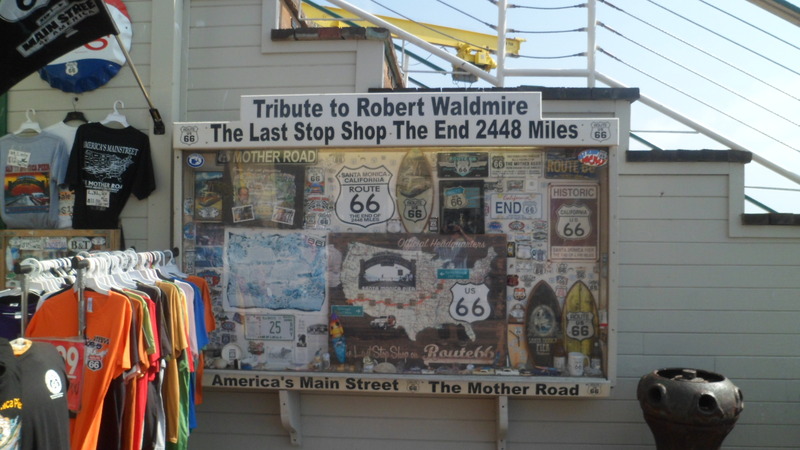 Looking at this horizontal edifice so often on NCIS, Los Angeles and Southland, I had to experience the end of Mid-America’s rainbow for real. 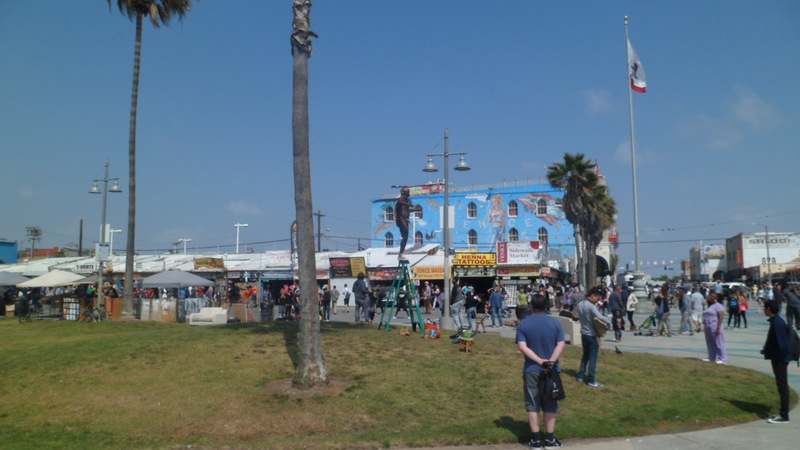 There were lots more people on the other side, as that is where the ticket booths for Pacific Park happen to be. 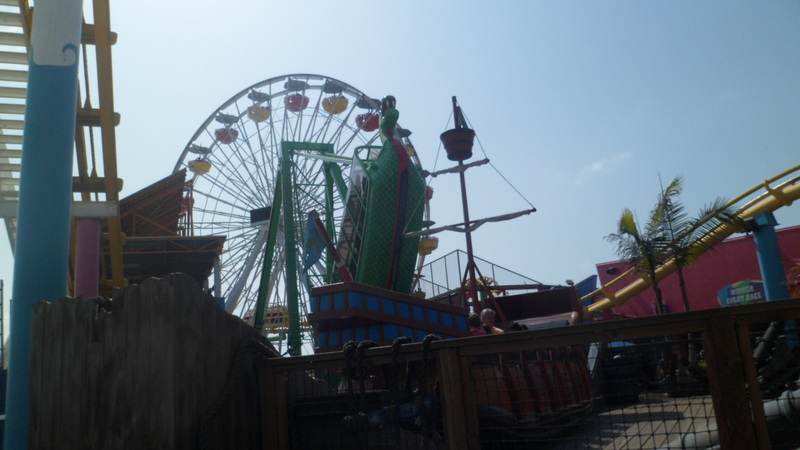 Then, too, the rides were full. 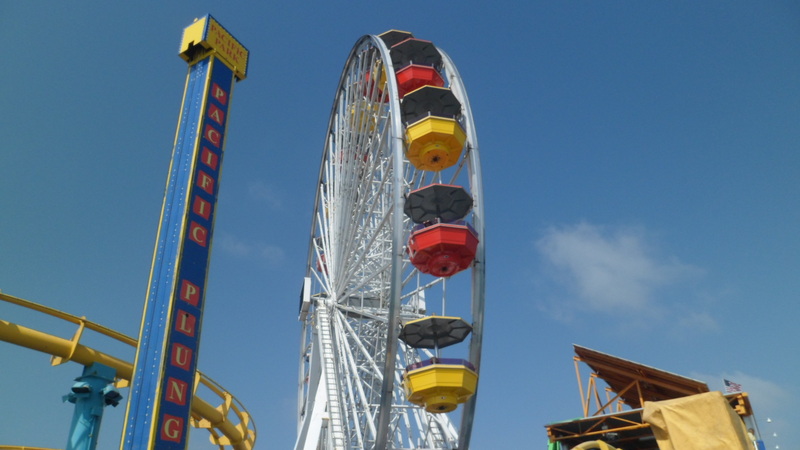 I have been on quite a few roller coasters in my time, though only one or two Ferris wheels. 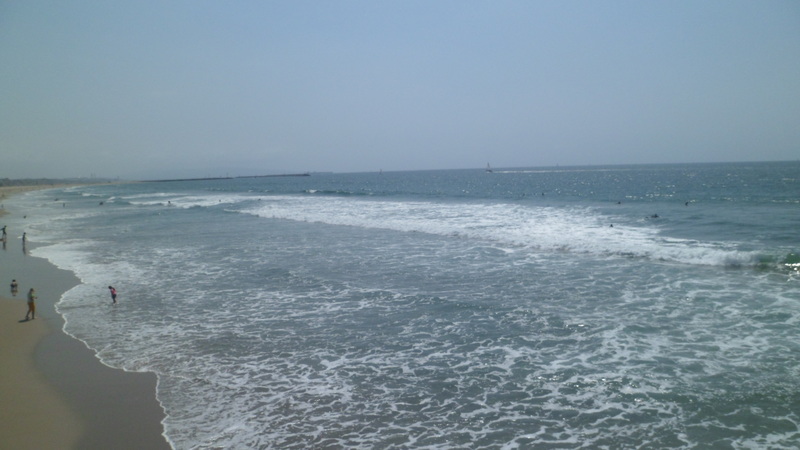 When all is said and done, the waves and the water are what brings me contentment, in a place like this. 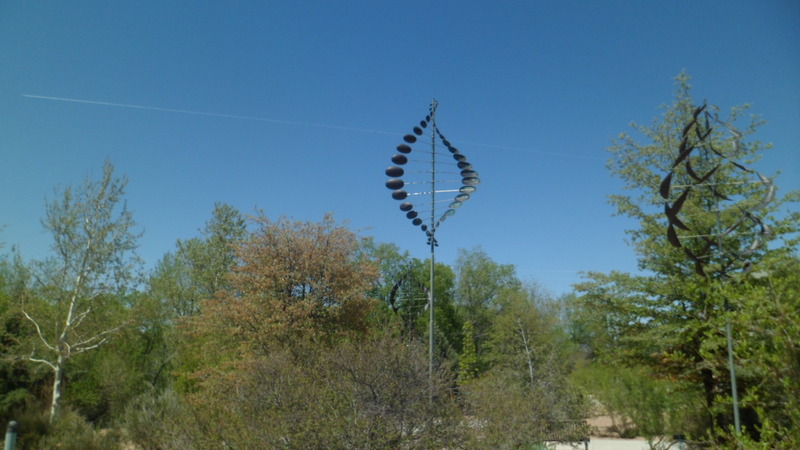 So, the Mother Road had to end somewhere, and the grand adventures that many seem to seek at Pacific Park dovetailed nicely with the end of this line from Chicago. 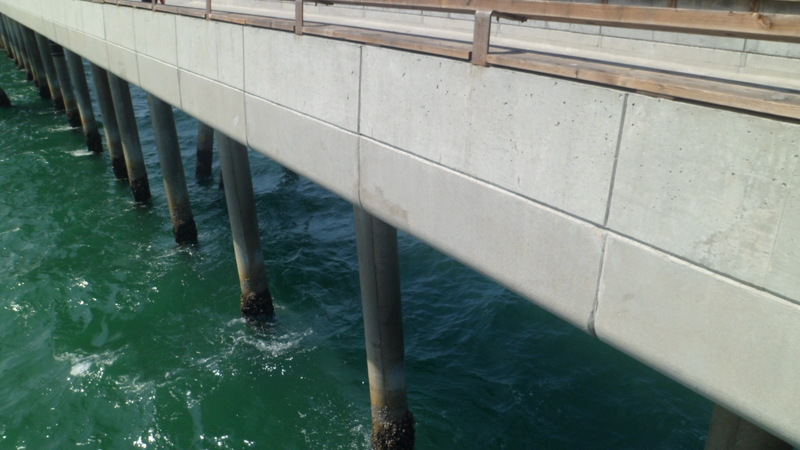 One could always just hop a boat and continue on to Santa Catalina, and some one of these days I will, but on that March 22 afternoon, I was content standing atop a mass of pilings. to my trusty car, which was too dirty to photograph. Oh, and I did take a photo of the Santa Monica snake charmer, his boa and a brave, but petrified, college coed. In the interests of the sensibilities of some of my most loyal readers, I have left that one in my Flickr account. 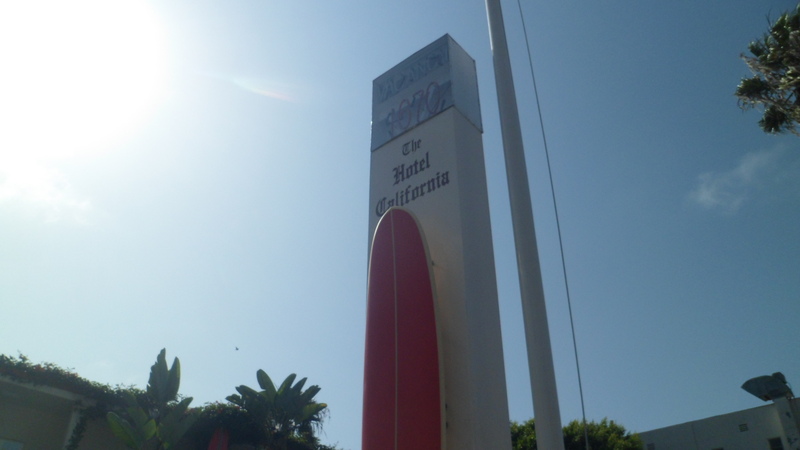 I would find that the Page Museum, near LACMA, was closed when I got to Museum Row, and I was exhausted anyway, so it was on to El Monte, and a healthy Chinese meal at Ming Yuen Restaurant (“You no need white rice this time of day!”), followed by deep slumber at a Budget Inn. Whenever I happen upon a beach resort that is oriented towards the masses of American people, I am thrown back to my childhood- to beaches like: Lynn, Revere, Nantasket, Nahant, Crane’s, Plum Island and Wingaersheek, MA; Narragansett and Galilee, RI; Hampton and Rye, NH and Old Orchard, ME. Millions are also familiar with Long Island, the Jersey Shore, Eastern Shore of Maryland, the Delaware Coast, Myrtle Beach, Virginia Beach, Waveland, MS and Daytona Beach. These places may remind some of theme parks, or WalMart, but they are essential to the well-being of lots and lots of good folk. 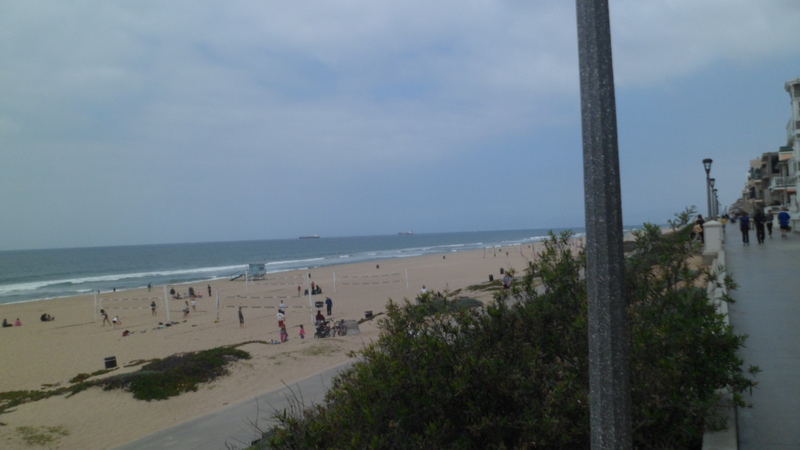 I visited two such mass-oriented beaches, along the western edge of Los Angeles, on Saturday, March 22. It would have been my late father’s 87th birthday, and Dad loved these kinds of places, so I joined the throngs, and had a blast. 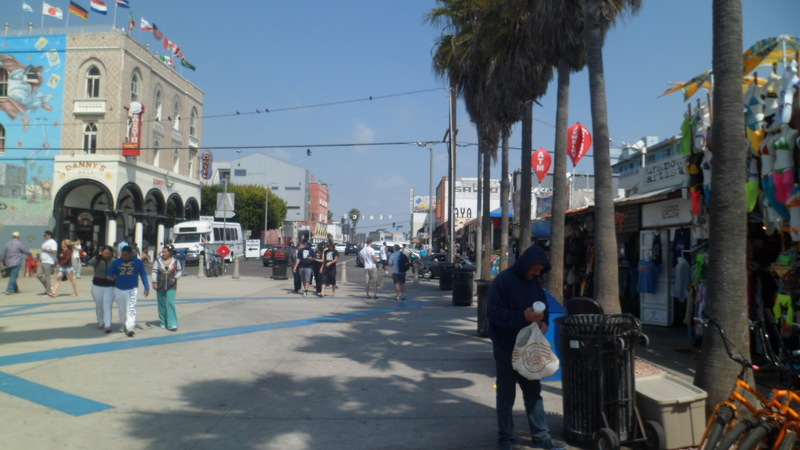 Venice, CA sits at the western tip of the City of Los Angeles, which operates the beach park that lies between upscale Marina del Rey and the bustling suburb of Santa Monica. There is plenty of kitsch to go around, and I enjoyed an all-beef sausage sandwich from Jody Maroney’s, for a quick, satisfying lunch. I may be an adventurous diner, at times, but I am never too far from my roots. The next order of business, though, was the beach. I was surprised that there were not that many people around the water. 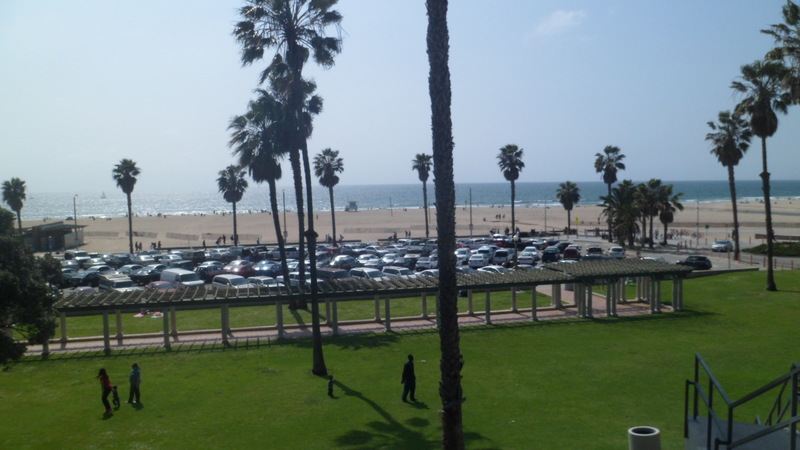 Most of the action remained along the Promenade and in the park, inland from the beach. I went into the water, just a bit, though. It was exhilarating! 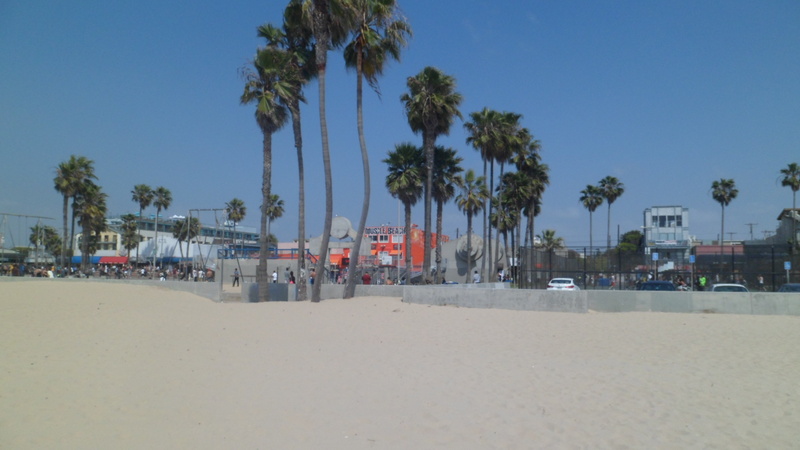 In short order, though, I came to Venice Pier. 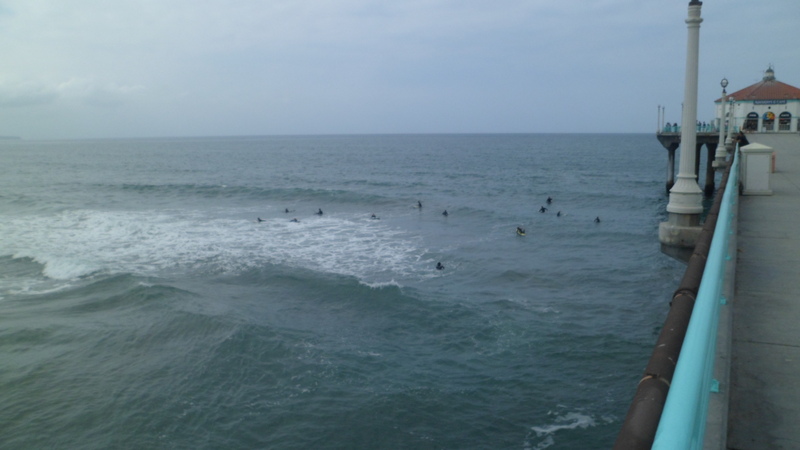 With a nod to the few surfers who were headed out to play in the ocean, I went up to see how the fishermen were doing. 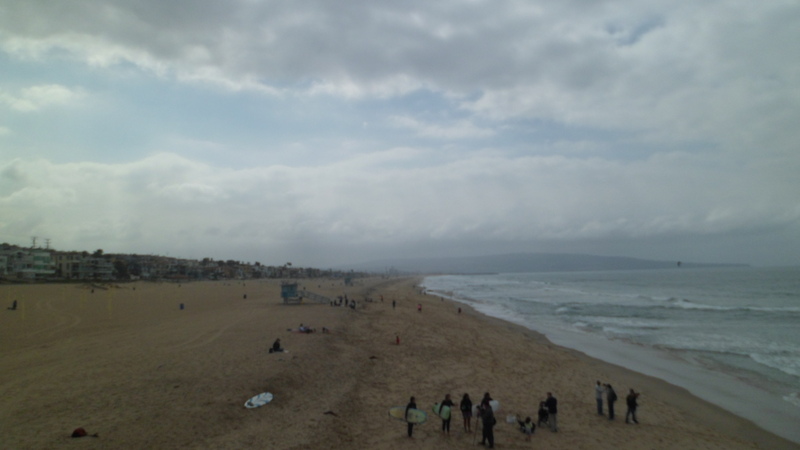 People were a bit more even-tempered than those I encountered earlier, in Manhattan Beach. 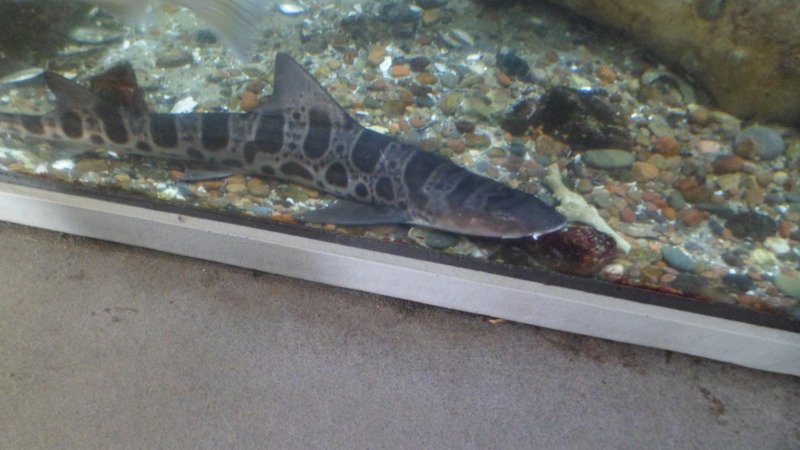 Maybe the fish were more accommodating here. 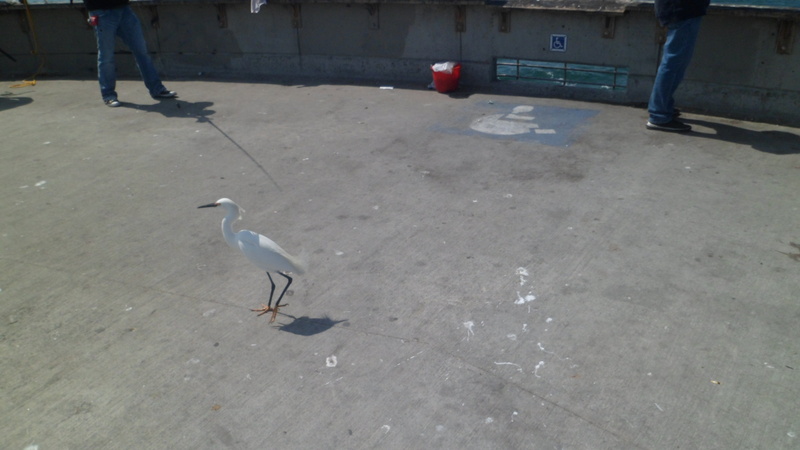 An egret seemed to think so. The water looked refreshing, from pierside, as well. After about a half hour along the beach, I gradually made my way up to greener pastures. There were many colours in evidence on the People’s Wall. Venice’s downtown also is riot of shades and hues- building-wise. A snake charmer was doing a fine job of handling his serpentine friend, on one of these corners. I decided not to take his photo, lest I capture something unfortunate. He ended up doing his act just fine, though, so I gave him a small tip. You’d have had a great time here, Dad. I was glad to have had the chance to make the trip, in your stead. 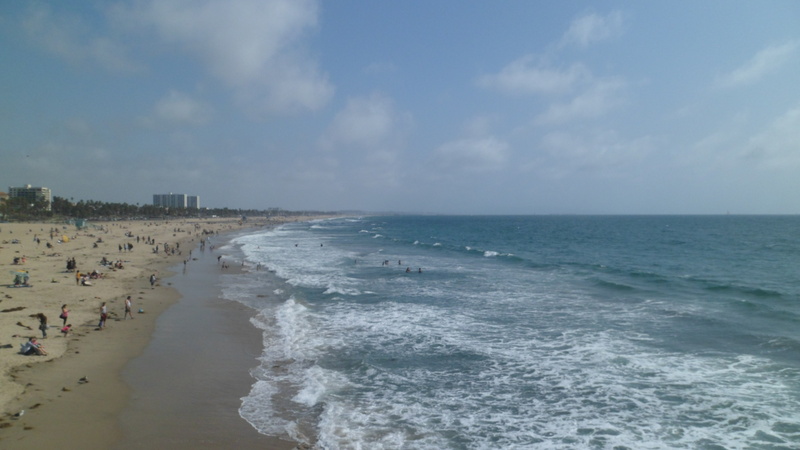 Manhattan Beach is a curious name for a place of sand and surf, smack in the southwest corner of Los Angeles County, yet the naming has a logical source: The town’s developer, Stewart Merrill, was a proud son of the Big Apple. 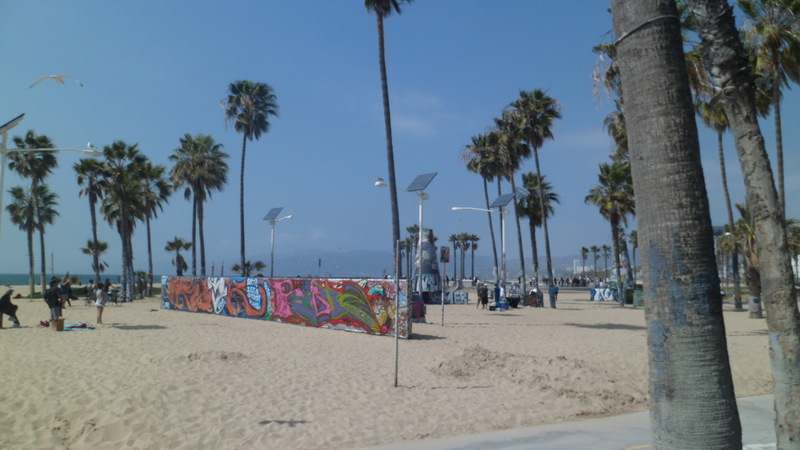 There is another parallel: This capital of Beach Volleyball is one of the most expensive parts of LA, even outpacing Beverly Hills in the Big Bucks department. 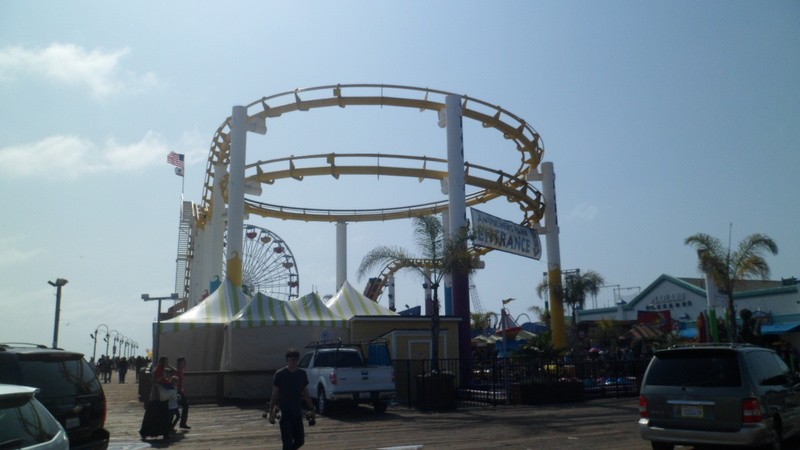 No one turned their nose up at yours truly, though, when I rolled on up from Lomita, on March 22. After a good night’s sleep at Lomita Motel and decent breakfast at Hot n’ Tot Family Restaurant, I was ready for the completion of one trifecta- the South Bay Beach cities (having visited Redondo and Hermosa Beaches two years ago) and making Manhattan Beach the first of three stops on that lovely Saturday (followed by Venice/Marina del Rey and Santa Monica Pier). The morning started briskly enough, walking downhill to the water’s edge. 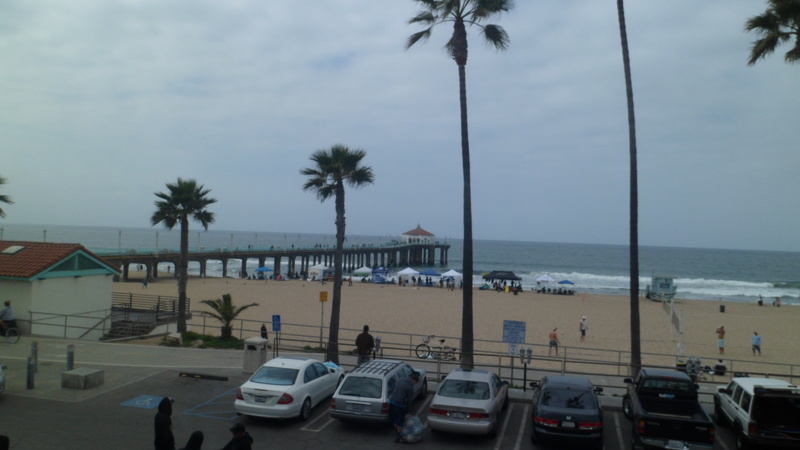 The famous Beach Volleyball Tournament was getting started, as I walked down towards the pier. 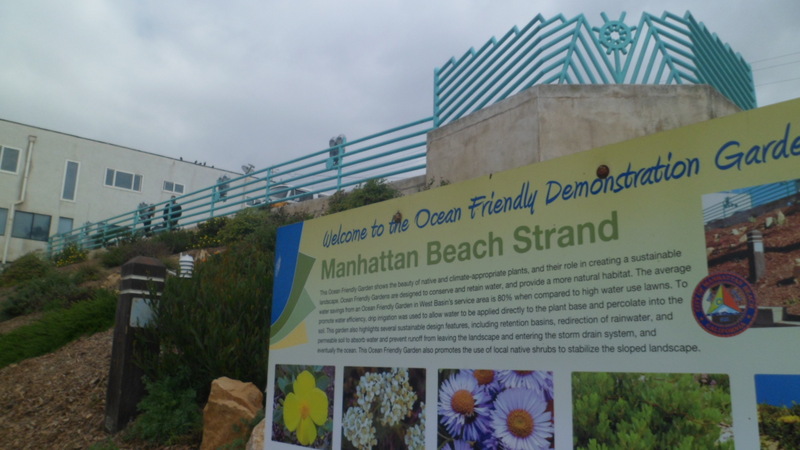 There is a nice beginning of a community garden, along Manhattan Beach Strand. 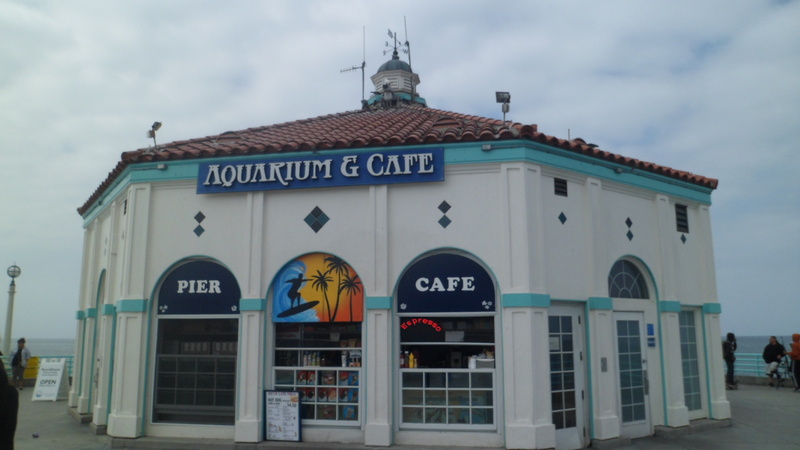 After looking at this for a bit, with a curious Filipino boy and his mother, I set my sights on the main focus of the morning, Manhattan Beach Pier, and its aquarium. 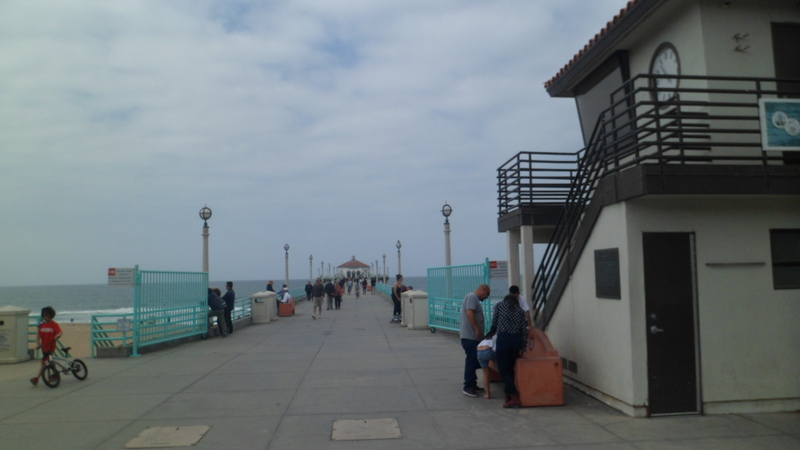 Of course, the walk along the pier afforded some fine sights, of beach and surf. 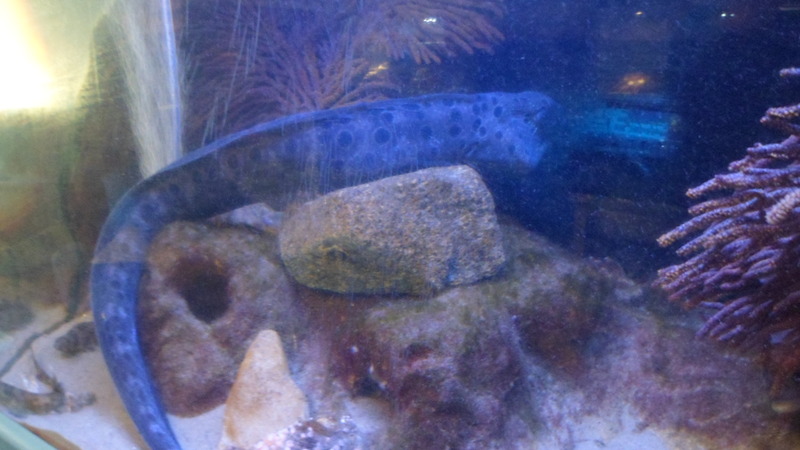 The aquarium was being cleaned by a patrol of Girl Scouts, under the watchful eyes of their Scoutmistresses. 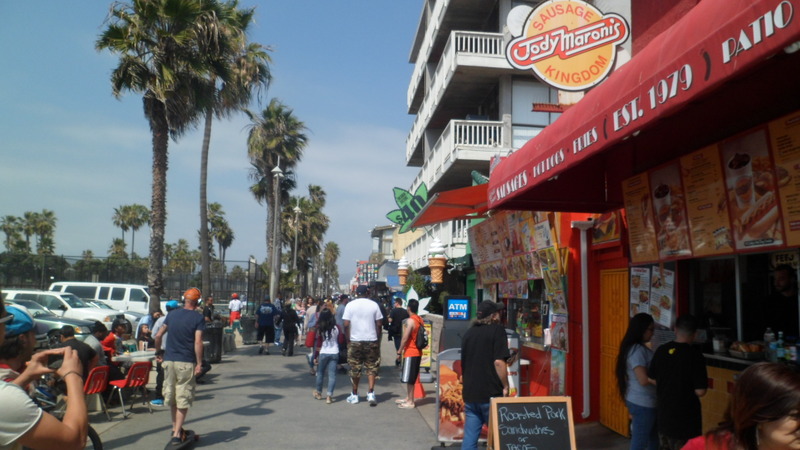 It was a good thing, as within earshot of the girls were a trio of foul-mouthed fishermen, who only shut up when the old Mexican snack bar vendor went out and told them “Tienes respeto por las ninas”. 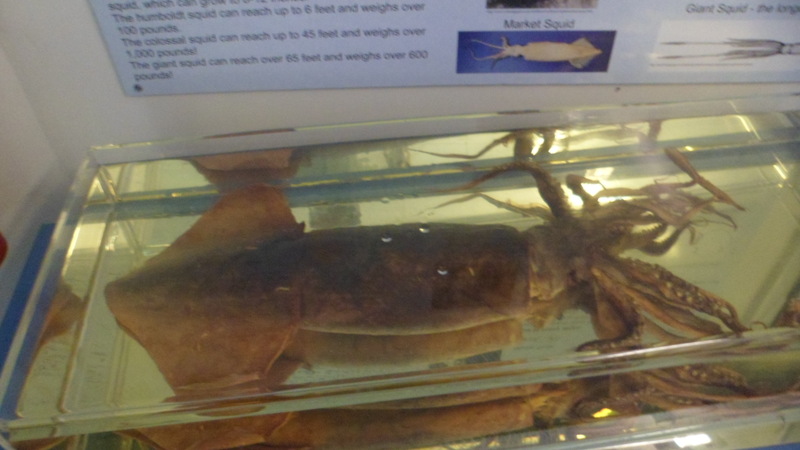 In the donations-only facility, there are several small tanks, featuring both marine invertebrates and small ocean fish. 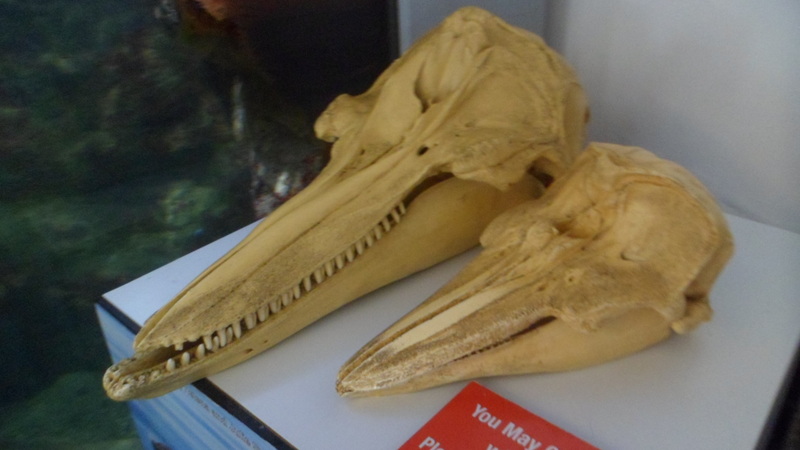 There are a few skulls of marine mammals, such as these porpoises. 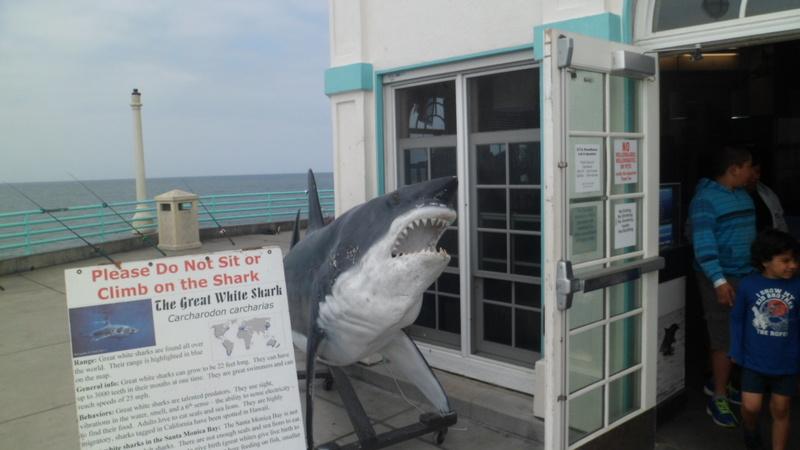 The Great White Shark would require two of this size facility. 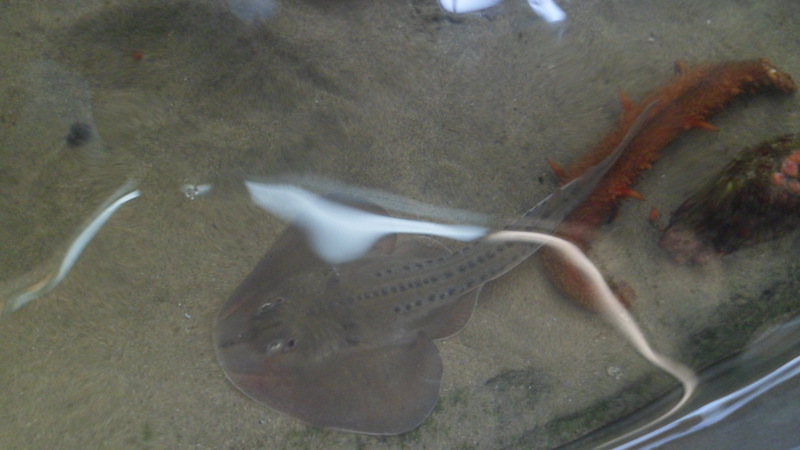 The little critters seem quite content, though, especially with the girls cleaning the outside window panes of their tanks. 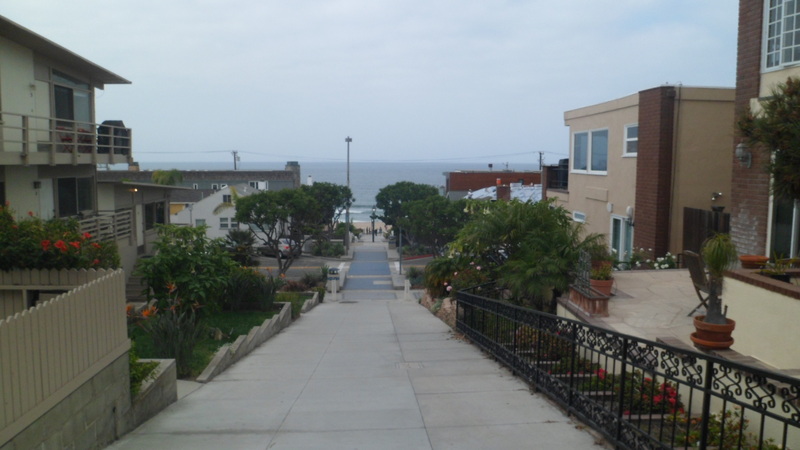 The South Bay still has much which I will explore later, including its Botanical Garden, near Redondo Beach, as well as San Pedro, Seal Beach and the looming presence of Long Beach. 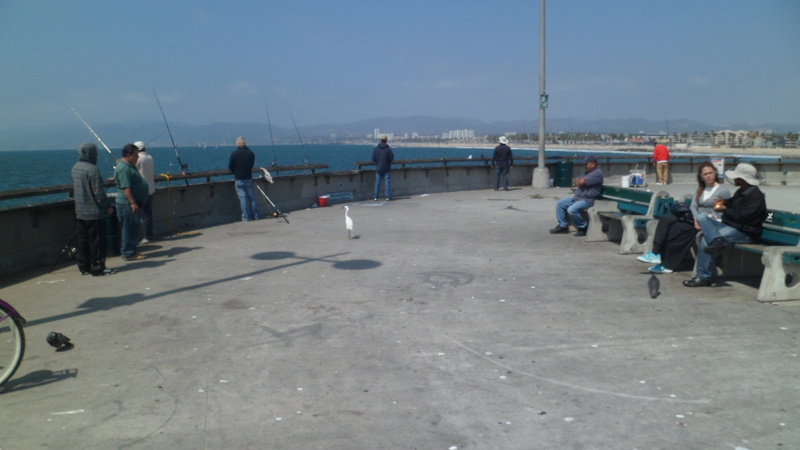 Awaiting me next on that day, however, was Marina del Rey.